We’re told not to take any wooden nickels, but wooden bitcoins are hard to resist. 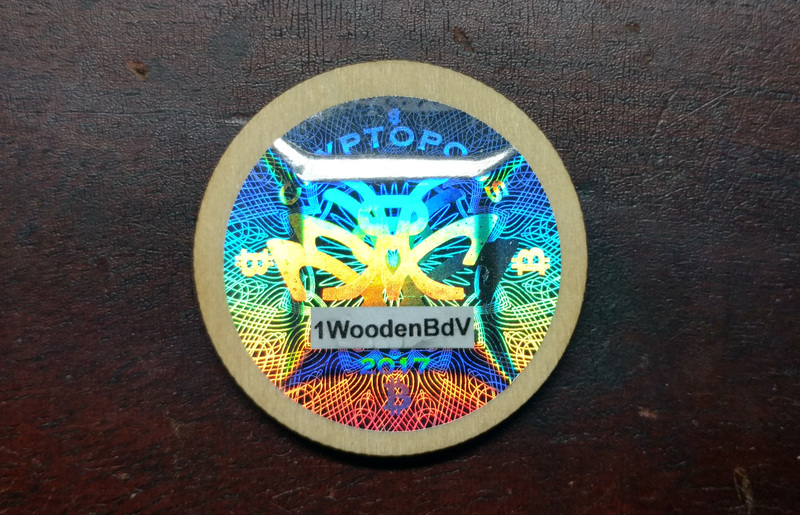 A collaboration between Cryptopods and the Bitcoin Penny Company, this wooden bee coin that I was lucky enough to land is an example of a trend in bitcoin collectibles: items of such limited production that they are essentially art projects. 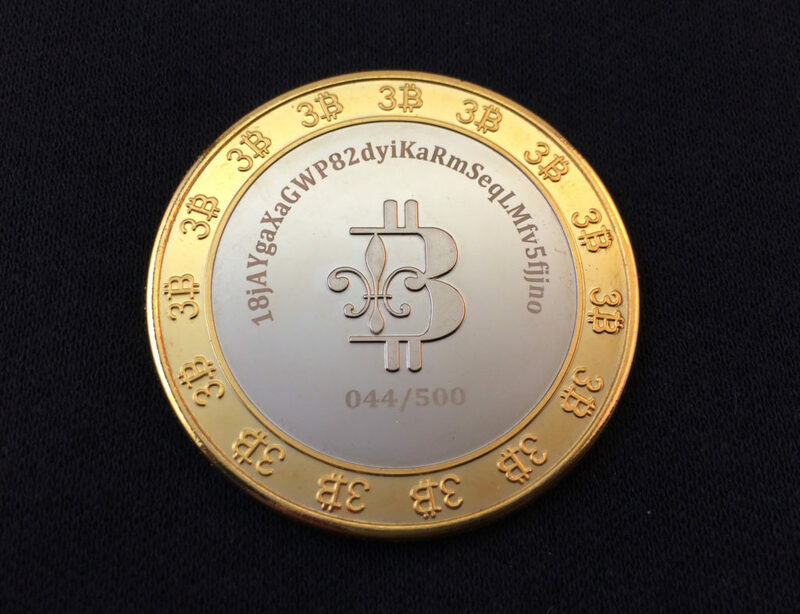 This coin is unique, the only one of its kind. 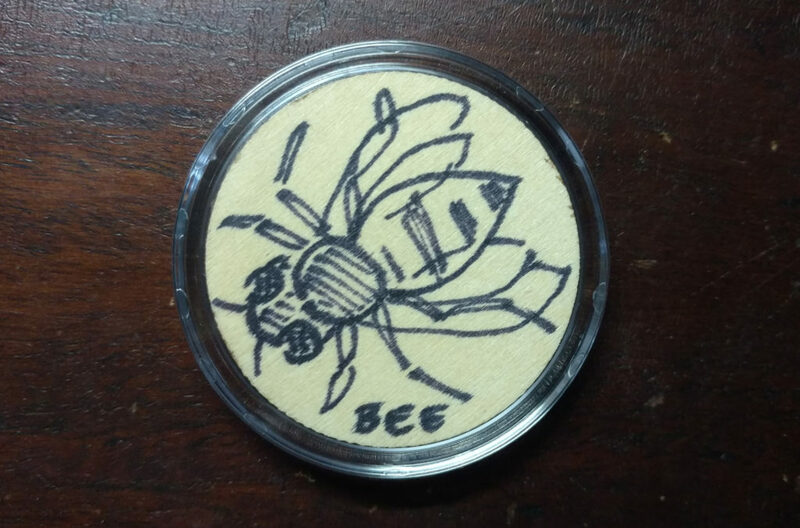 It is part of a set of 10 insect-themed wooden coins, each with a different doodle by the creator of Bitcoin Pennies: ant, bee, butterfly, centipede, dragonfly, flea, ladybug, mantis, wasp and worm. 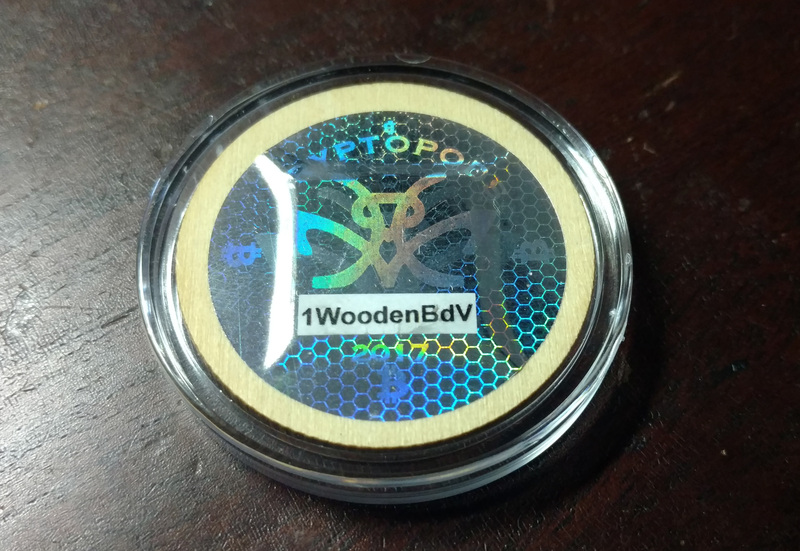 Each coin has a unique vanity address starting with “1Wooden”, with the key secured on the back under a Cryptopods hologram. 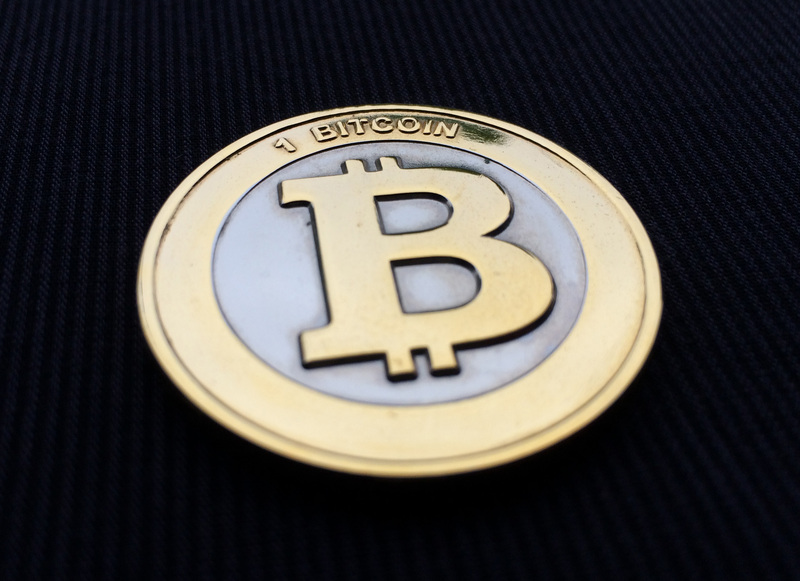 The coins were then auctioned off on the bitcointalk forum. They’re rough, but that’s part of the fun: wooden tokens featuring hand-drawn sketches, part of a set whose appeal is very niche. Will someone, someday, try to track down and re-unite the set? Maybe. Or maybe these will simply be unique items in collections around the world. What makes a collectible, anyway? 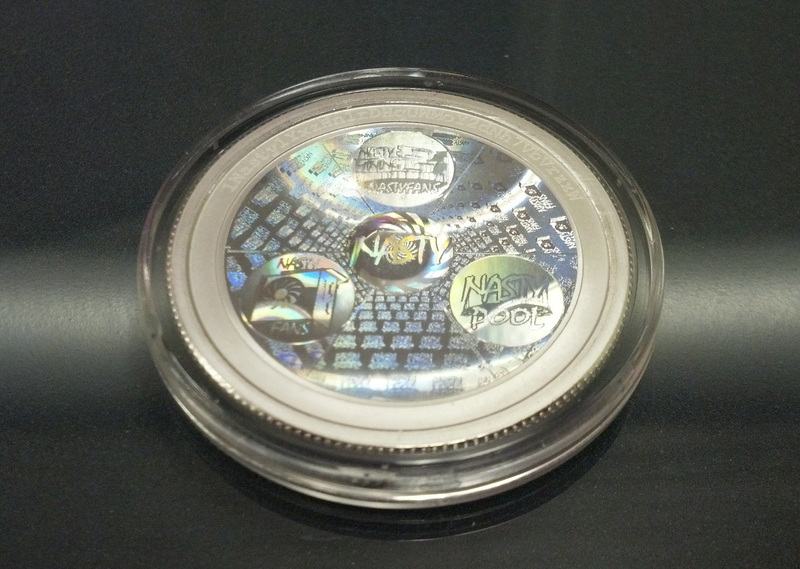 When we think of collectible coins, we think of things that have been mass-produced, albeit in controlled numbers. But art can be collected too, and each piece is unique. Both worlds are combined in delightful projects like this. 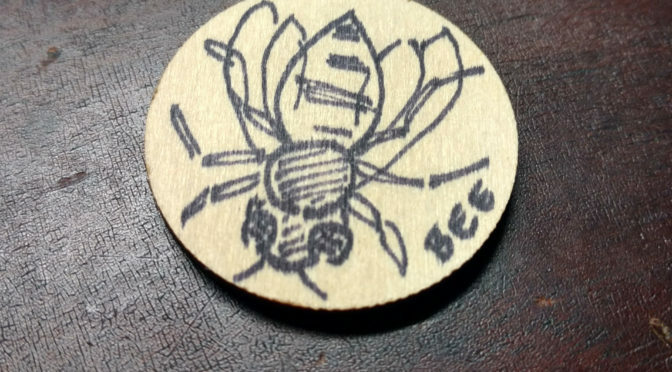 Cryptopods & Bitcoin Penny Co. wooden insect coins: the bee. One of the most beautiful series of physical bitcoins has long been from Lealana, a creator from Hawaii. 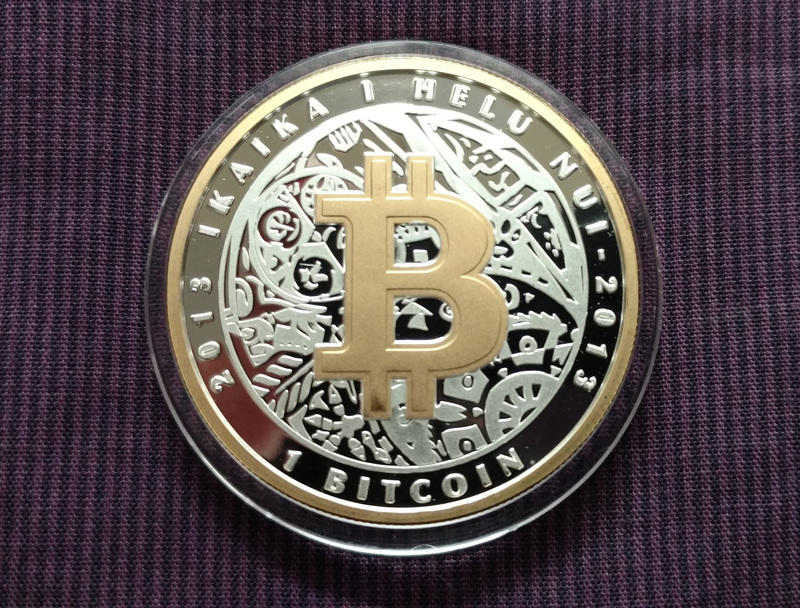 Created in 2013, they are striking for the unexpected combination of traditional bitcoin imagery with Hawaiian-inspired decorative elements. The “B” is there, front and center, but it floats on a sea of swirling imagery that draws the viewer in as they try to decipher it: A ship’s wheel? The tail feathers of an arrow? A paw print? It’s up to us to look and to see. 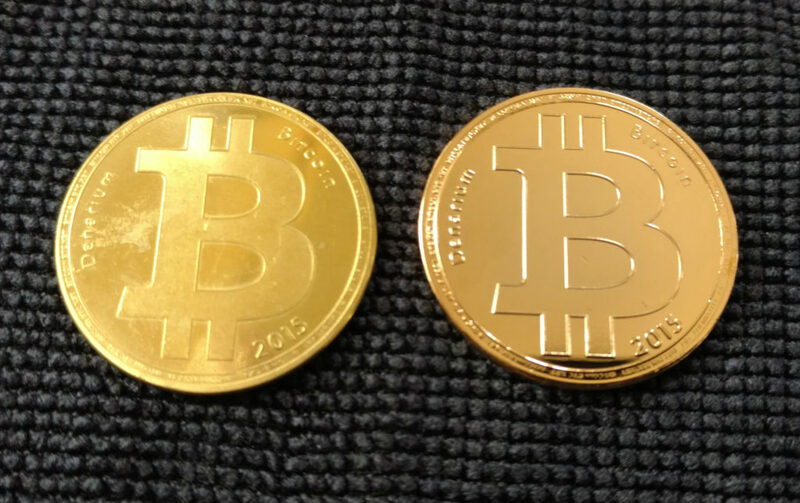 The juxtaposition is a refreshing change in a niche field of coinage which often tends more towards the literal as it struggles to artistically depict what bitcoin might stand for. 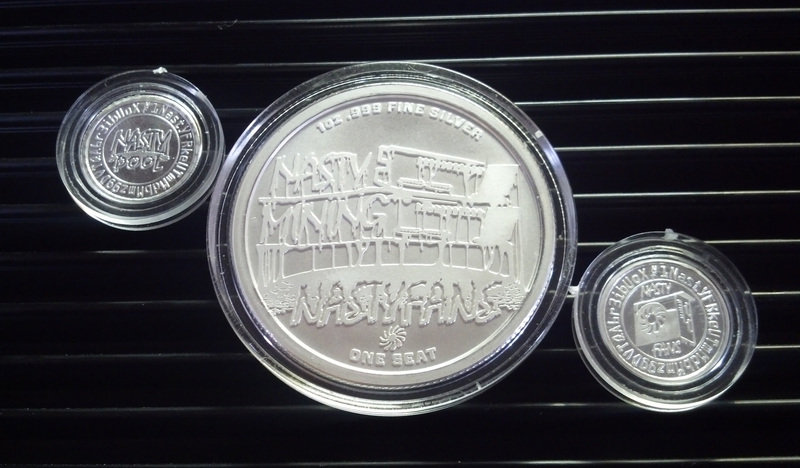 They are also simply dead gorgeous coins with brilliant proof finishes, made in fine silver in denominations of .1, .25. .5 and 1 BTC. The tenth is made with 1/4 oz. of silver, the quarter with 1/2 oz. and the half and one are made with a full ounce. 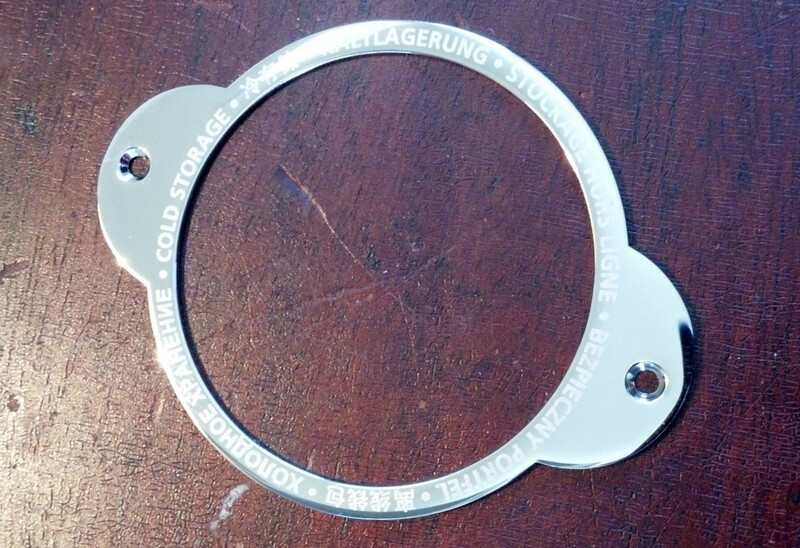 The diameters vary across the range, with the half and one being the same size (39 mm). 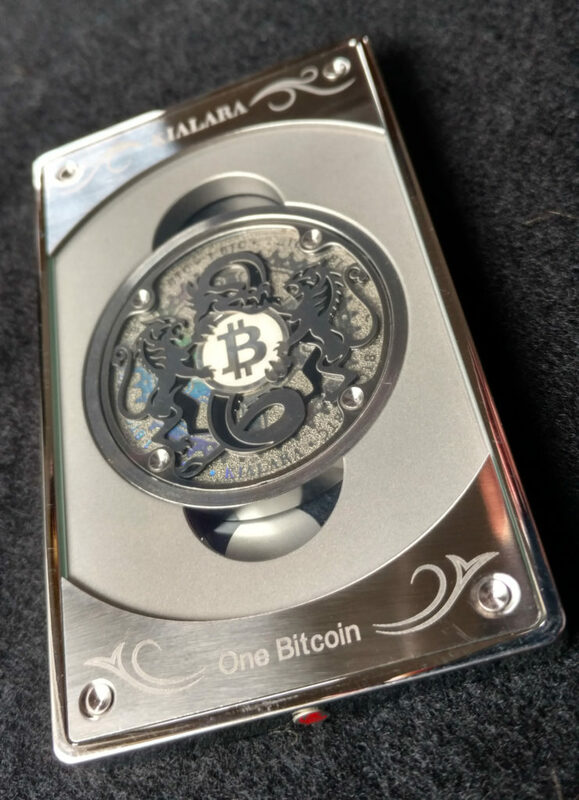 Lealana .25 BTC piece, with case. 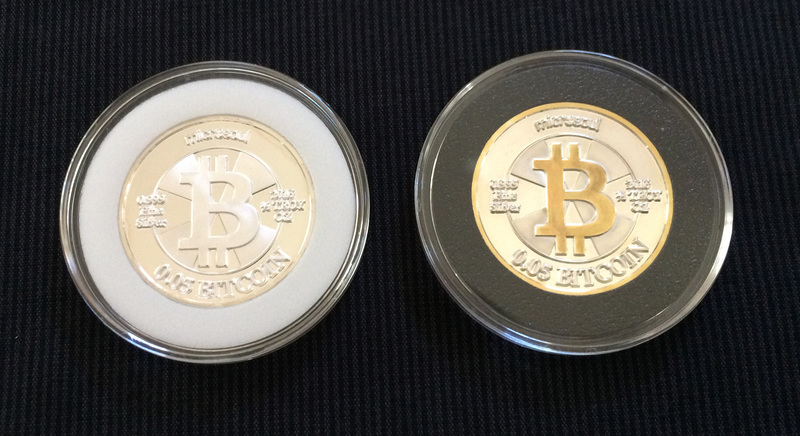 The jewel of the set is the gilded 1 BTC piece, boasting 1 oz of silver and a striking gold “B” and rim. The gorgeous Lealana 1 BTC. 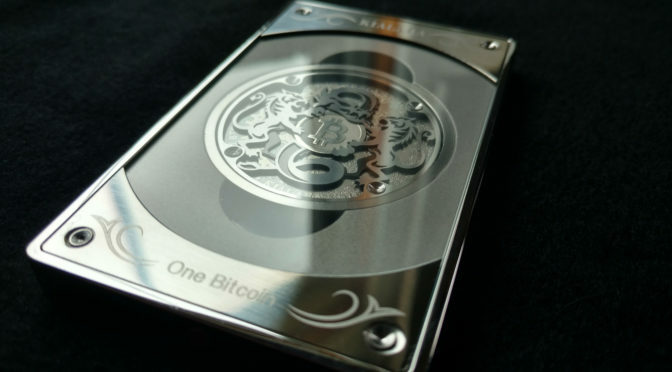 When Max Mellenbruch began making Kialara bitcoin cold storage wallets in 2014, he set a new bar for design, quality and creative vision. 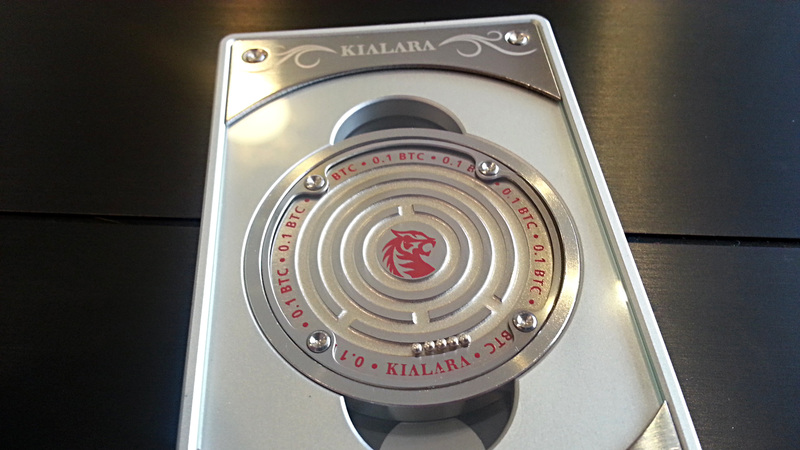 The original Kialara was a startlingly new take on what a cold storage wallet could be, and his later Labyrinth and Signature Series designs were no less inspiring. Along the way, though, he’d ended up with some extra components from the original series. Instead of letting them go to waste, he made two new iterations on the original design and released them in limited edition runs in 2015. For one, he replaced the steel medallion in the center with a sterling silver one, and for the other, gold. Kialara silver, detail of obverse. Another creator might have called it a day, but Mellenbruch went on to make so many other small tweaks that these gold and silver series Kialaras really shine as their own objects, and are much sought after by collectors. The most striking change, though, was changing the aluminum housing to one made from stainless steel, polished to a mirror finish. 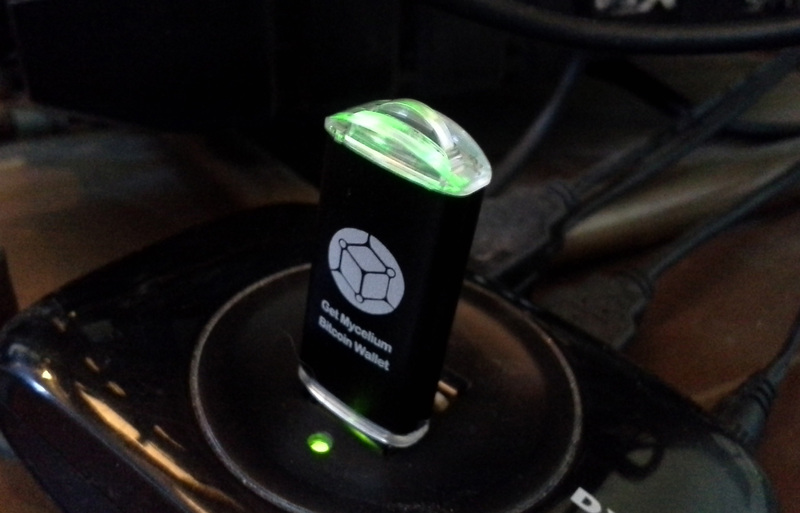 This not only makes the whole thing shine with a near-holy glow, but it doubles the weight so it feels… awesome. It’s hard to say why heavier things feel as if they’re higher quality, but they do. In this case, that feeling of quality runs deep, like a vein of precious metal. Kialara silver, detail of reverse. Kialara silver, detail of stainless steel housing. 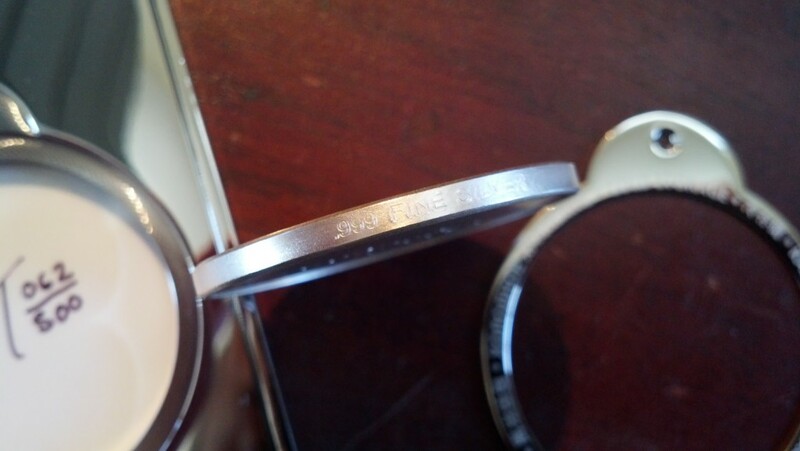 Kialara silver, detail of funding tag. 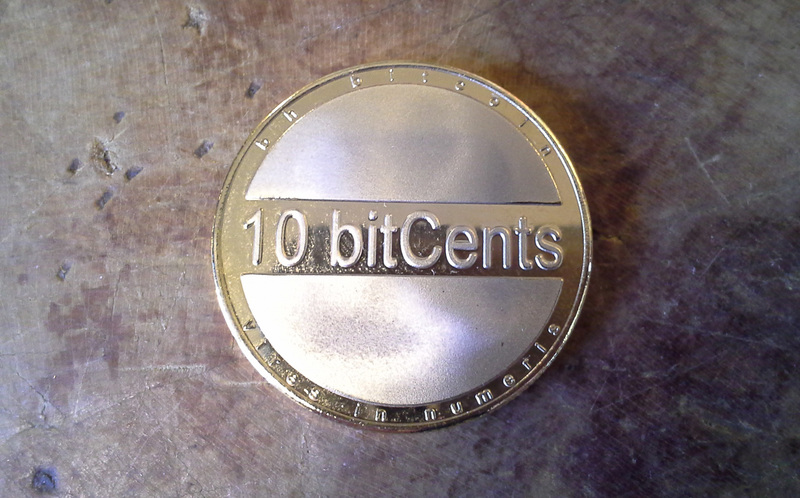 In addition to the relatively tiny-denomination (at the time) .01 BTC pieces that Microsoul made back in 2013, he also made a much more weighty 1 BTC piece that wasn’t branded with the Microsoul name. 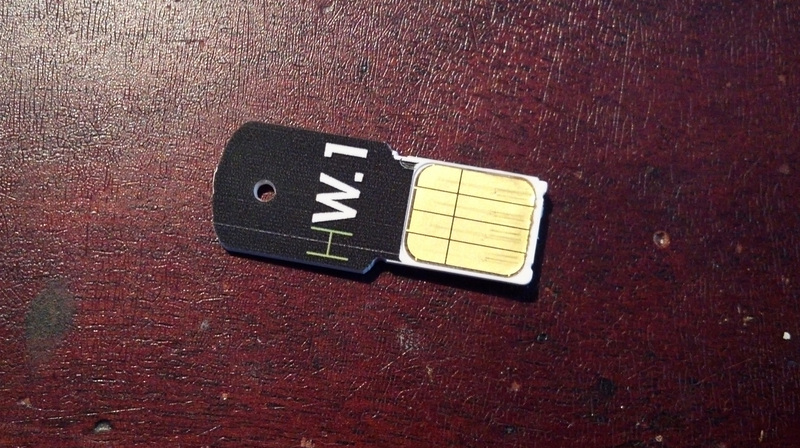 It only had a design on the front, and a flat reverse on which a scrambled private key was engraved and then hidden by a very heavy sticker. In a number of ways, this was a very basic design (as one might expect from an early effort), but the sheer heavy, bold shininess of it is kind of impressive. 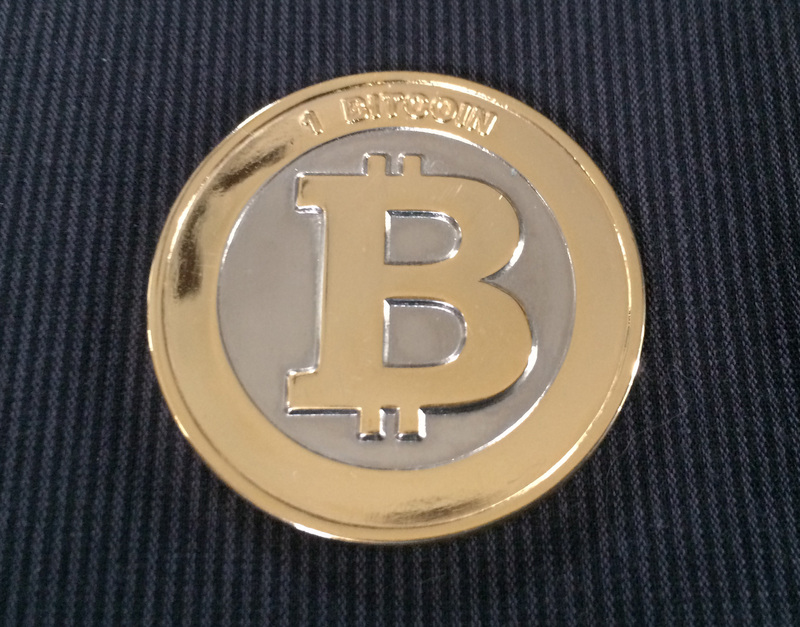 I’ve always thought it would make a better medallion than a coin, set into some necklace worn by a Bitcoin rapper (do we have those yet?). 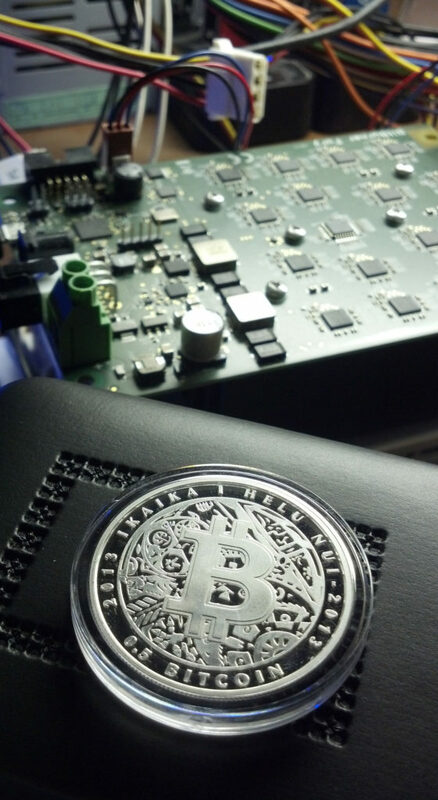 The Microsoul 1 BTC piece had bling! 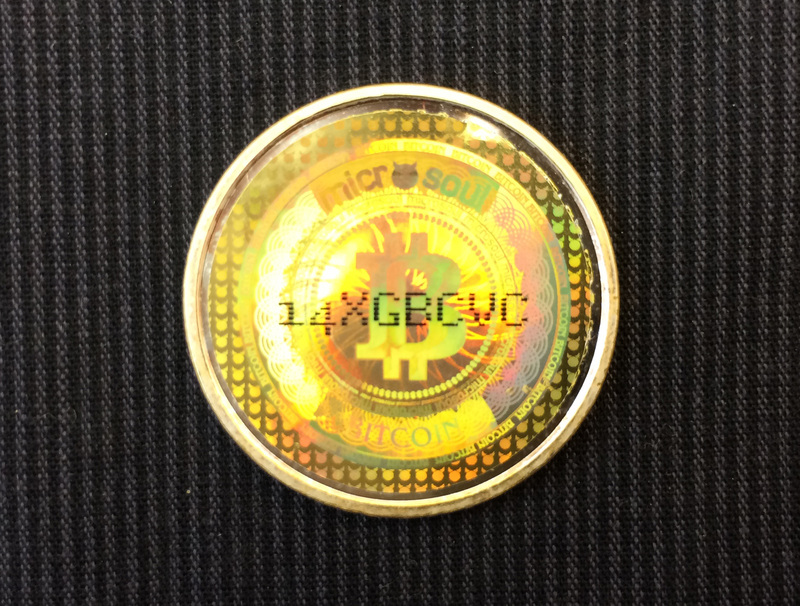 Microsoul 1 BTC piece, obverse. 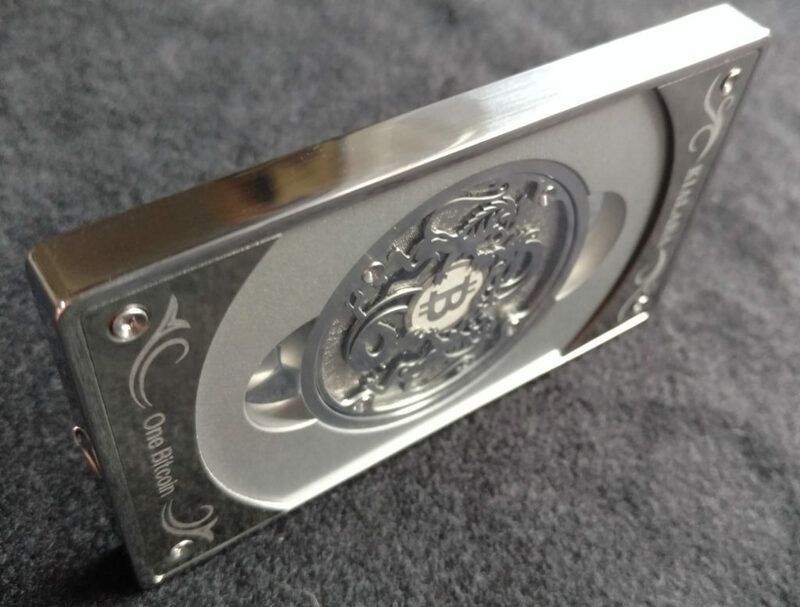 Microsoul 1BTC piece, showing blank reverse after redemption (engraved private key obscured). In order to redeem the private key, the user had to follow a set of instructions to transpose some of the characters. It’s not clear to me whether or not these rules varied from coin to coin. 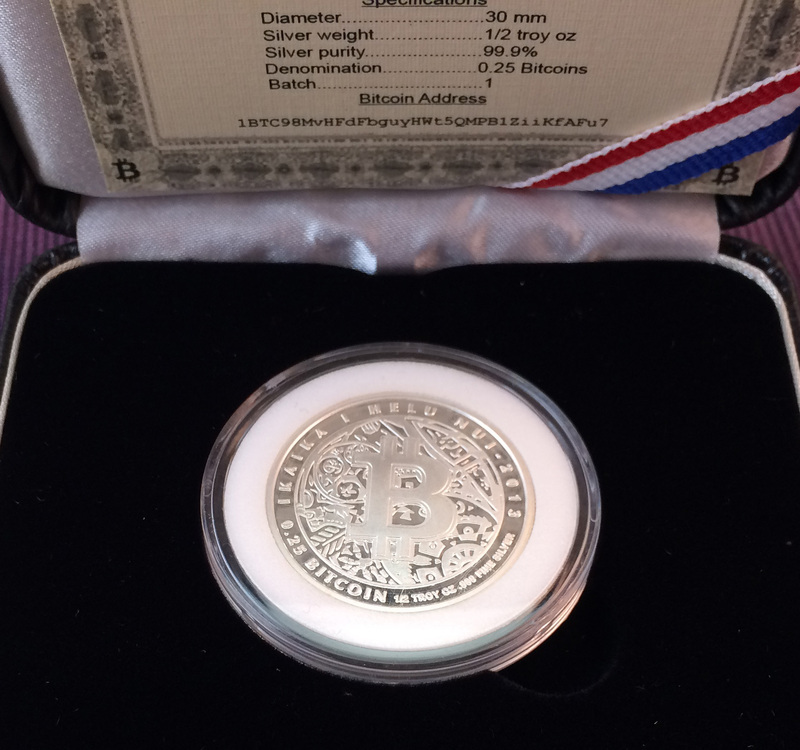 In 2014, Microsoul added a new denomination, a .05 BTC coin cast in 1/2 oz. of fine silver. These had a more traditional 2-sided design, with a proper hologram protecting the private key. Unfortunately, the gold plating was very rough, and while it generally looked fine on the big gold “B,” where the date was meant to be plated it sometimes appeared as not much better than a few gold splotches. These were also a bit close to the original Casascius designs, not quite an exact copy, but not very different, either. A very nice touch on these was having the coin numbers engraved in the rims of the coins. 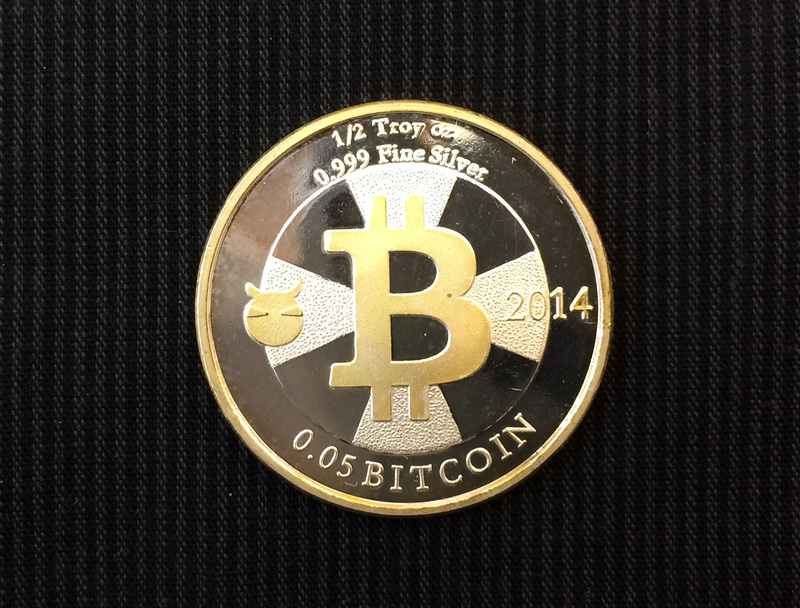 2014 Microsoul .05 BTC piece, obverse. 2014 Microsoul .05 BTC piece, reverse. 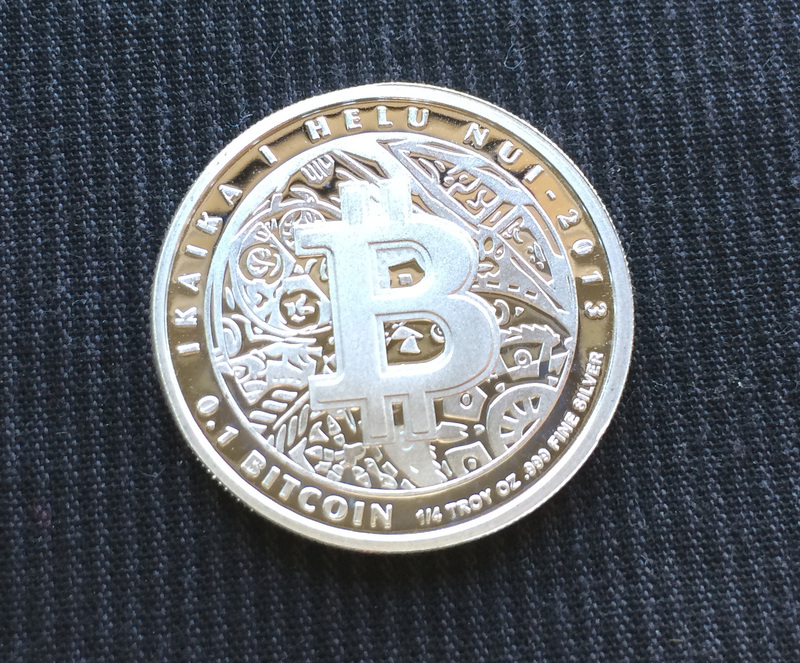 2014 Microsoul .05 BTC piece, showing engraved rim. 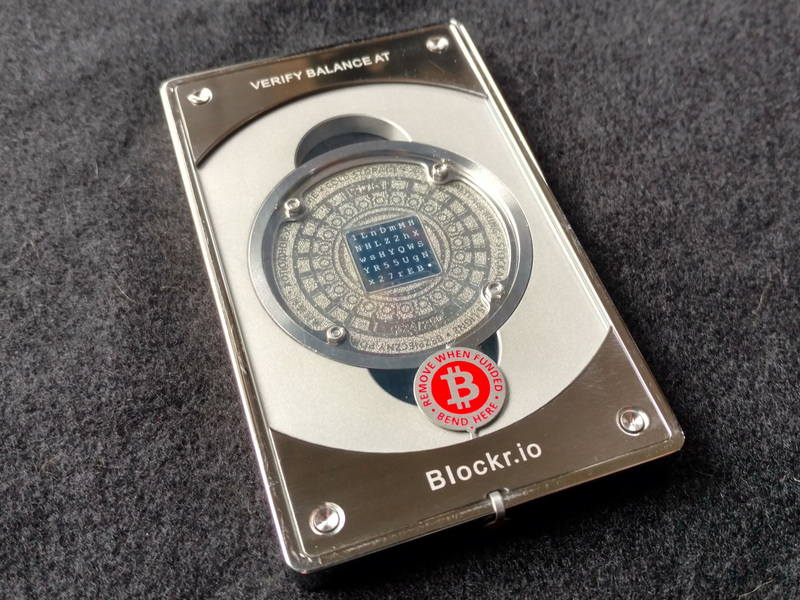 In 2016 Microsoul improved on many of these weaknesses with an update of the .05 BTC coins featuring a deeper, more boldly-struck face and a new hologram design. He offered both a gilded and ungilded version. Still unhappy with how his mint of choice was executing the gold plating, however, Microsoul opted to try gilding them by hand, which created some interesting effects. The gilding was certainly clearer and stronger, but there is some evidence of the “by-hand” nature of the process, a sort of slight waviness or unevenness in the finish. One could consider this a flaw, or an interesting quality of a very uncommon coin. 2016 Microsoul .05 BTC piece set, obverse. 2016 Microsoul .05 BTC piece set, reverse. 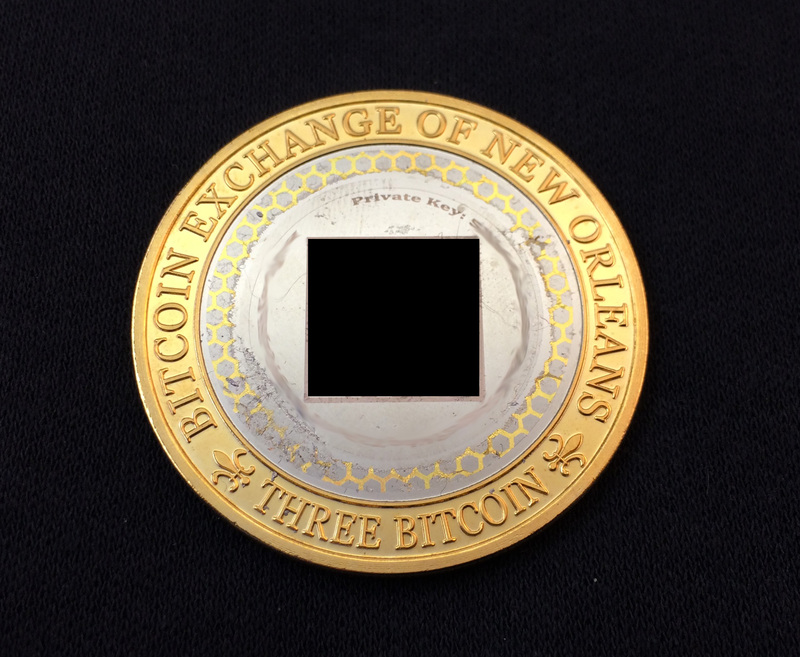 In addition to making half-bitcoin and one-bitcoin pieces, Nolacoin (“The Bitcoin Exchange of New Orleans”) also made a three-bitcoin piece, and I picked one of those up back in 2014. It’s a beautiful coin, with a two-tone color scheme of mirrored silver in the center and a golden outer margin. Like the other denominations, it’s plated brass and not precious metal, but that doesn’t change how pretty it is. 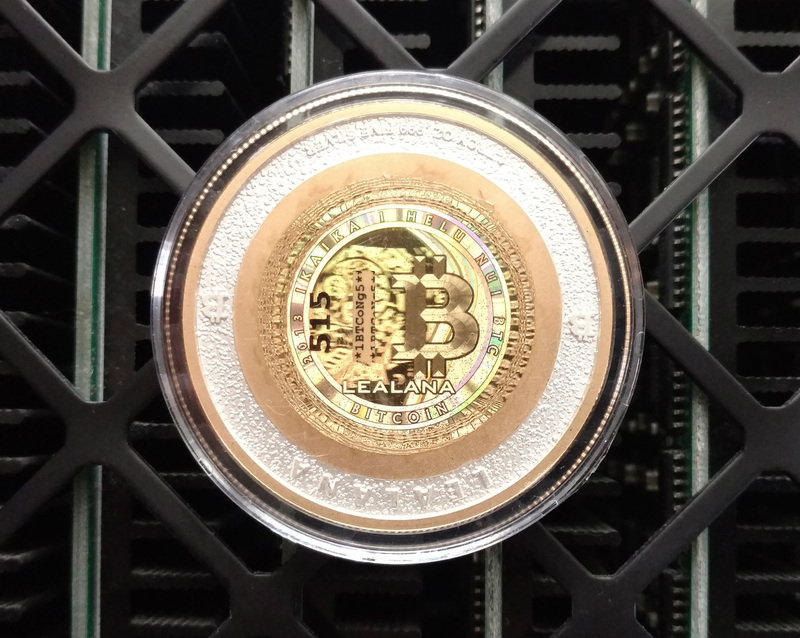 It is the same size as the half and the one, and also features the public address, the private key and a QR code of the private key laser-engraved into the metal of the coin. 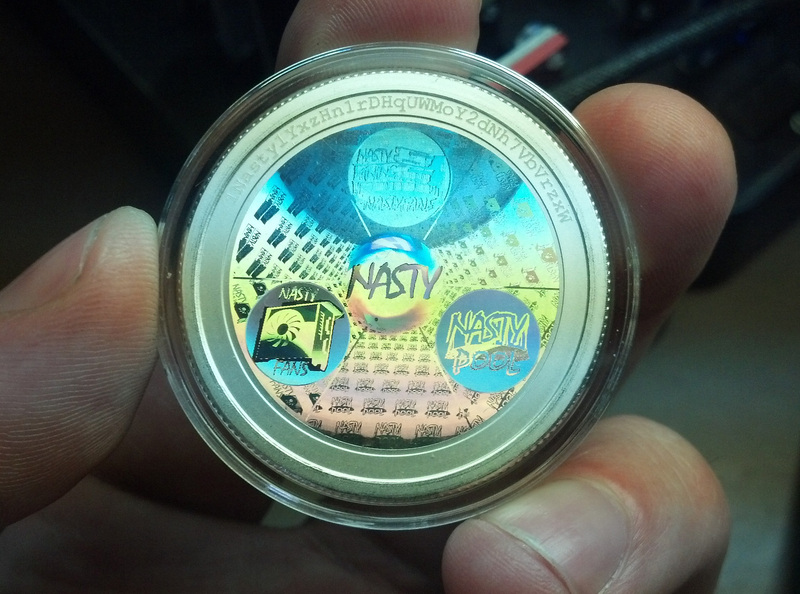 Nolacoin has long since stopped making coins, but at least he left us some remarkable designs. 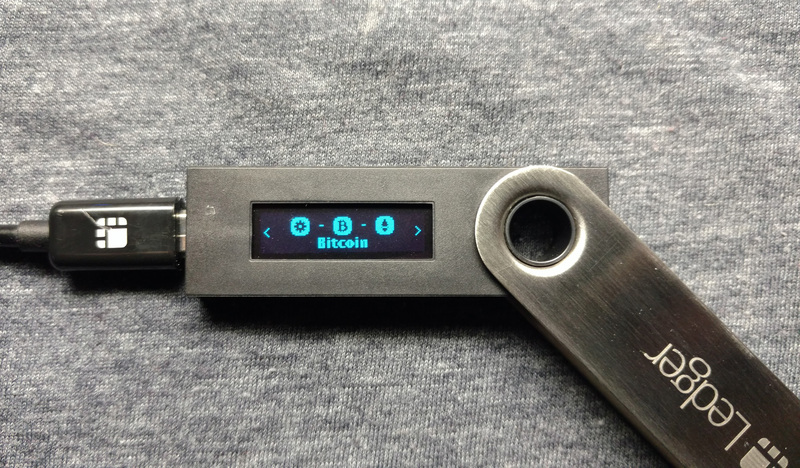 While there are some 5 BTC pieces out there from various manufacturers, this is the only 3 BTC piece that I’ve come across. 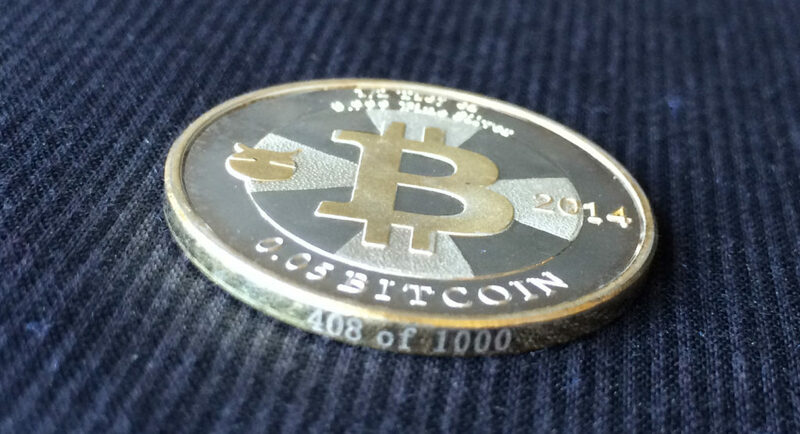 It’s a big coin with a big denomination, especially at today’s exchange rates. 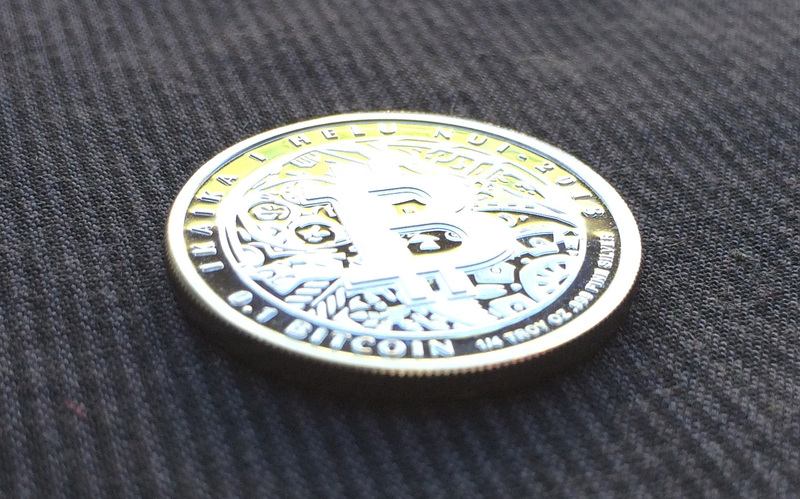 Nolacoin 3 bitcoin piece, obverse. 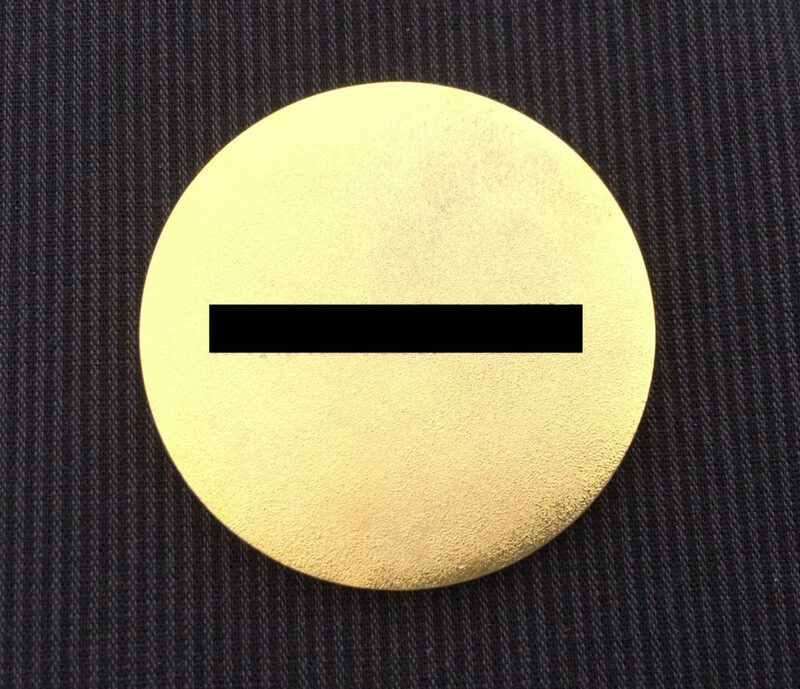 Nolacoin 3 bitcoin piece, reverse, after redemption (key obscured). 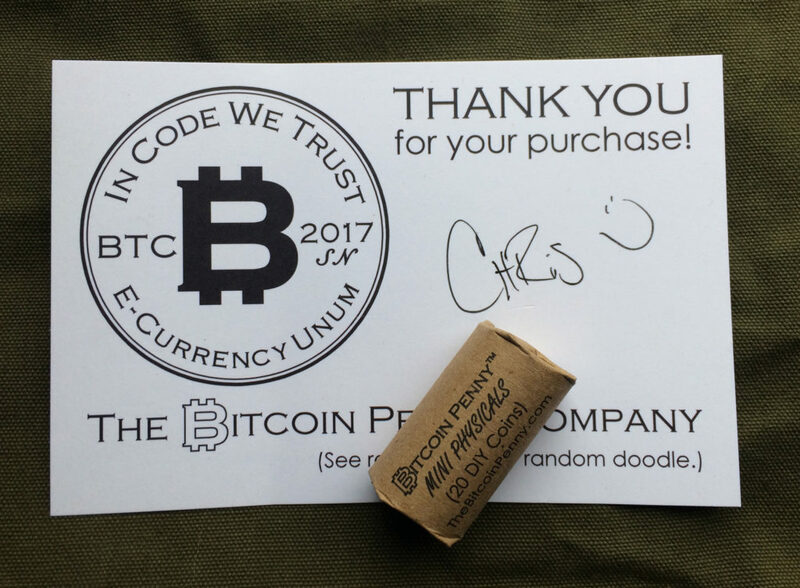 It was a natural progression from creator-funded physical bitcoins, to self-funded physical bitcoins, to DIY physical bitcoin kits, to bitcoin collectibles with no pretense of containing bitcoin at all. 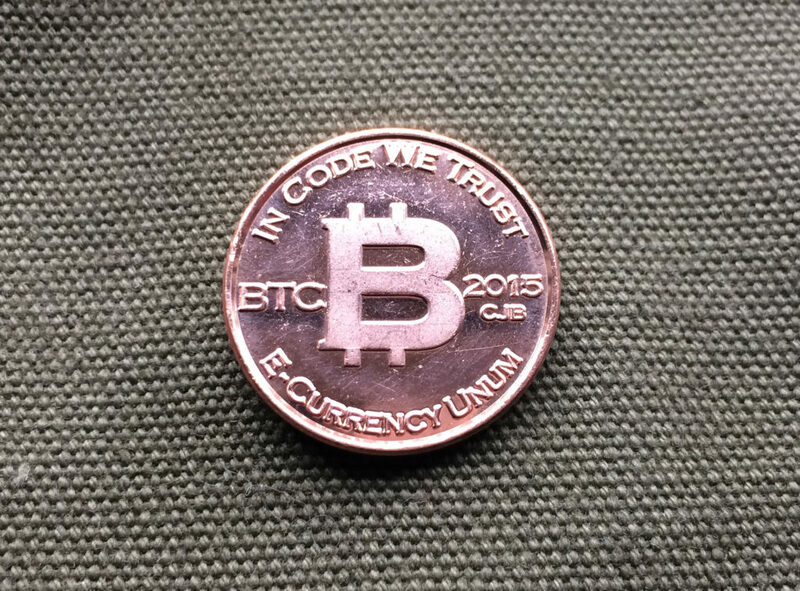 The Bitcoin Penny is a really fun example of this. 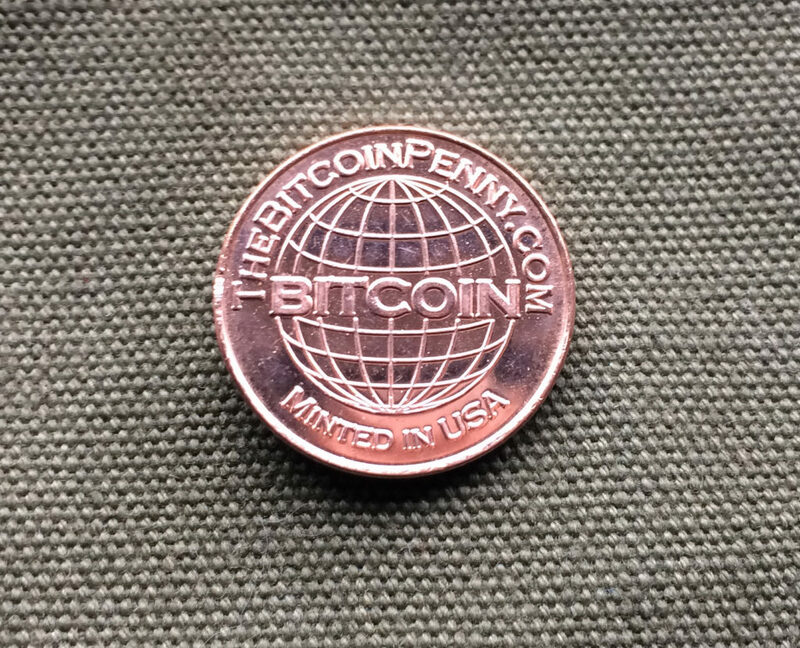 Introduced in 2015 by the Bitcoin Penny Company out of South Carolina, they’re simply copper penny-like coins with a big bitcoin “B” on the front, and “bitcoin” spanning the globe on the back. Why? Well, why not? Lighten up! These are inexpensive, attractive tokens that would be great to hand out at a conference or talk, at a party, at holidays, in a gift bag, as a conversation starter… the possibilities go on and on. And, of course, they’re a great item to add to one’s collection. 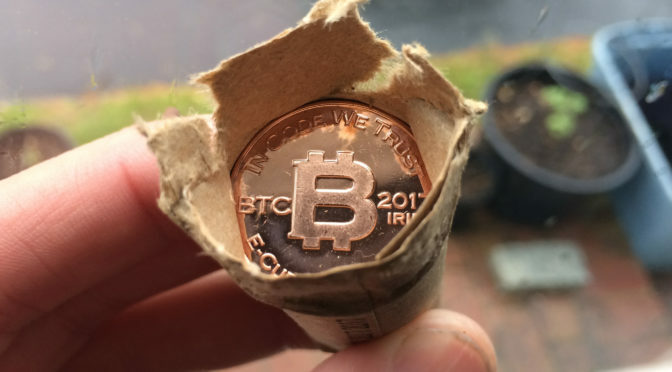 Eventually, though, things come full circle, and in 2017 they introduced a DIY version which is entirely blank on the back, and comes with special Bitcoin Penny holograms so that you may, if you choose, print your own private keys and seal them up on the back of the coins. 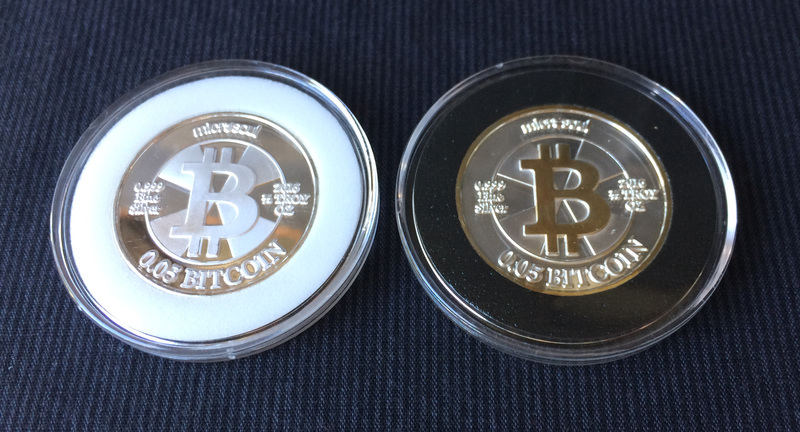 2017 Bitcoin Penny with blank reverse and holograms. Roll your own! No, wait, that’s not right — buy a roll and make your own! Even better, you can buy them by the roll! Make a whole batch and fund them with whatever you like, hand them out and spread the word. 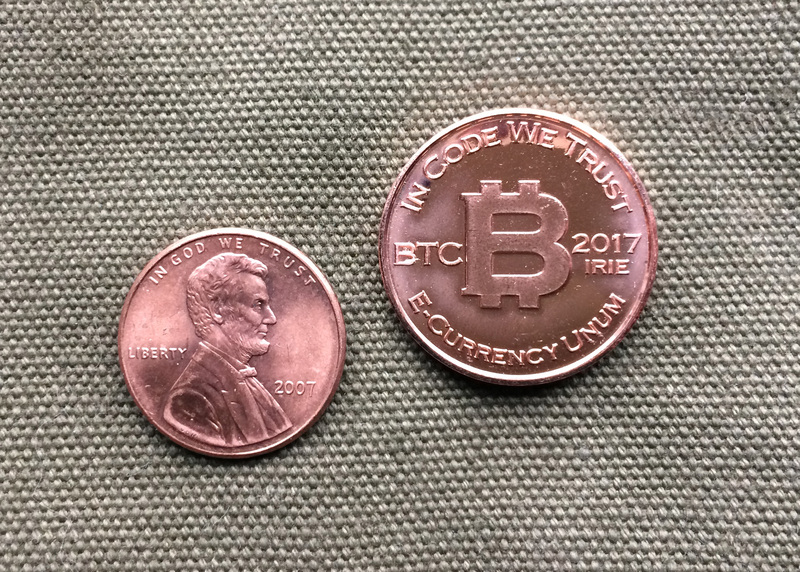 Bitcoin Penny next to some other kind of penny for reference. The final excellent touch? 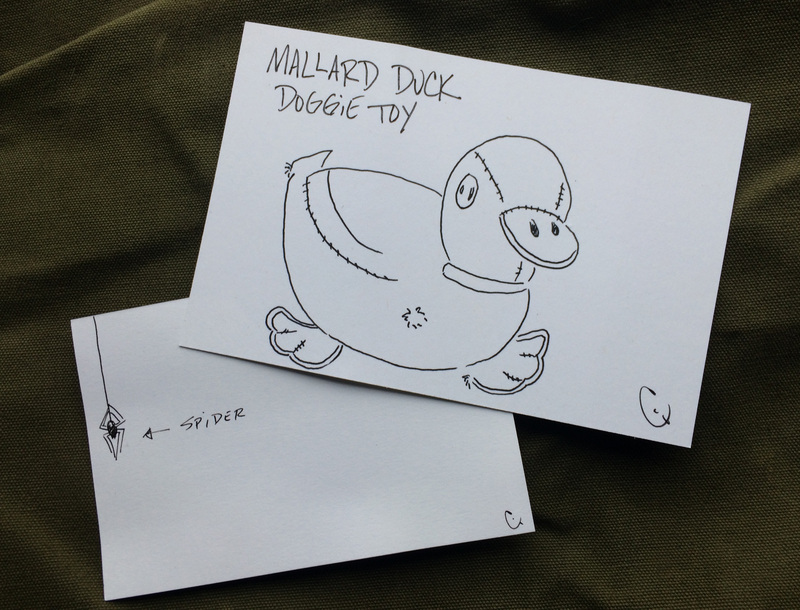 Sometimes there’s a doodle in the package. 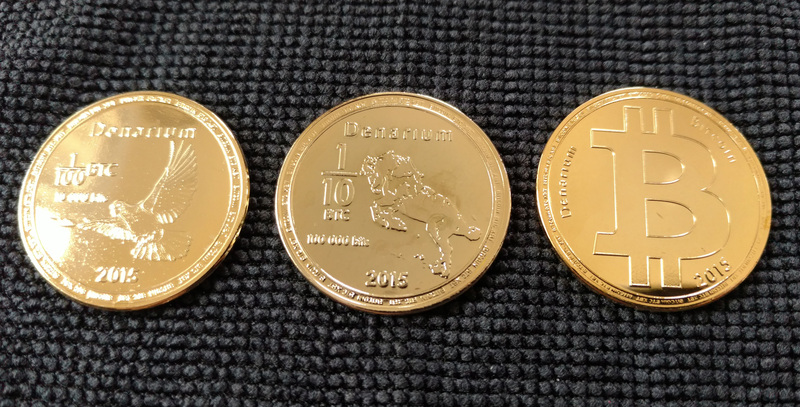 Cryptopods “Ravenbit Podified” coins in copper, brass and bronze, obverse. Cryptopods “Ravenbit Podified” coins in copper, brass and bronze, reverse. It’s not the first time someone’s repurposed some blanks with new keys and holograms (OgNasty did it with some Casascius 5 BTC pieces in 2014), but Cryptopods has given this offering the works: a limited, numbered run of 101 coins, three different metal types (brass, copper, and bronze), air-tites and laminated certificates of authenticity for each. 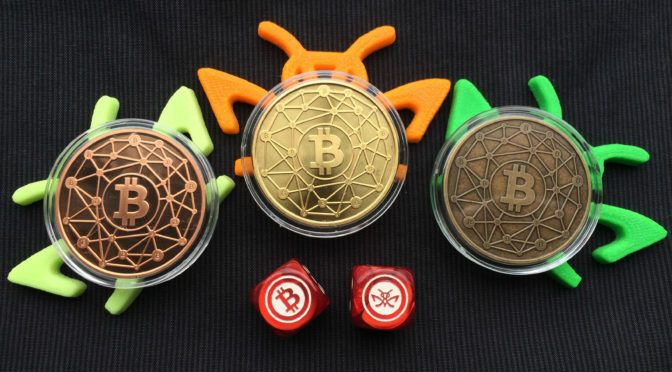 Bitcoin dice and, uh, plastic bug things are also available with set purchases, or by request. Apparently someone really likes bugs, probably minerjones since there’s a mantis in his bitcointalk.org avatar; digicoinuser is the other creator of Cryptopods. Both have longstanding good reputations. 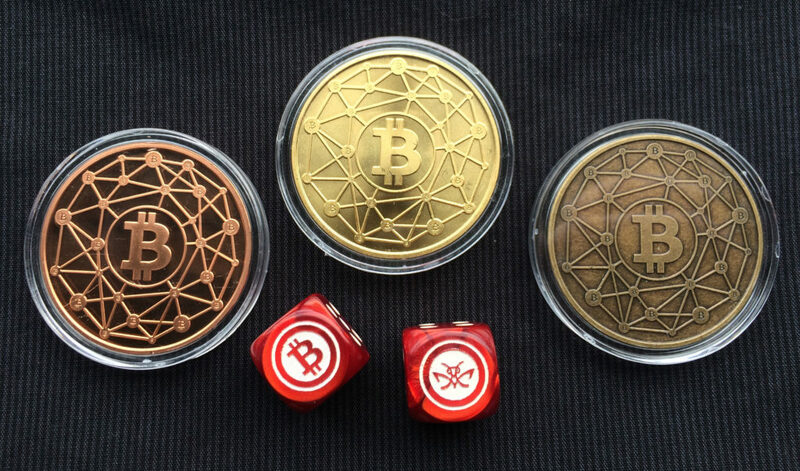 Cryptopods “Ravenbit Podified” coins with Bitcoin dice. The dice are darn cool. 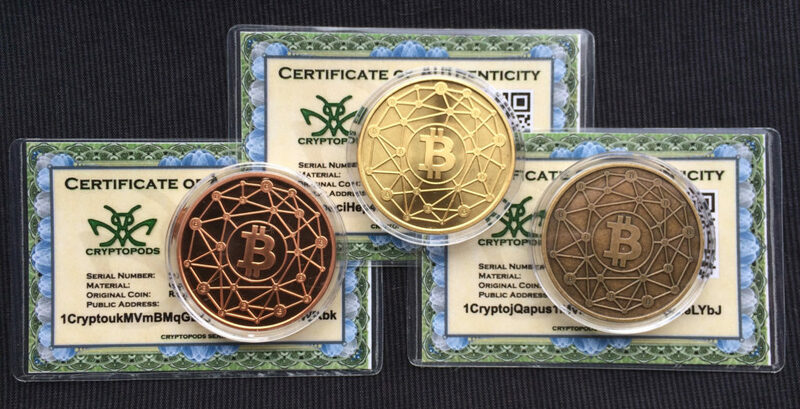 Cryptopods “Ravenbit Podified” coins with laminated certificates of authenticity. These are fine coins, and it’s a great opportunity to pick up a Ravenbit coin if you missed them the first time around. 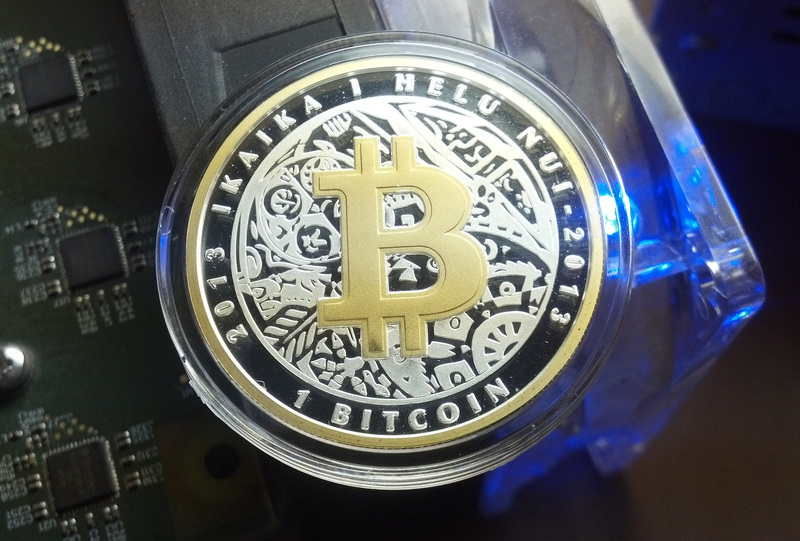 The Cryptopod holograms are lovely and feature the current year, 2017, to differentiate from the “2014” originally designed into the metal. How many coins have two dates on them? Kinda neat. A window in the holograms lets one view the series number and firstbits, both of which my be looked up at cryptopods.com/keys/. 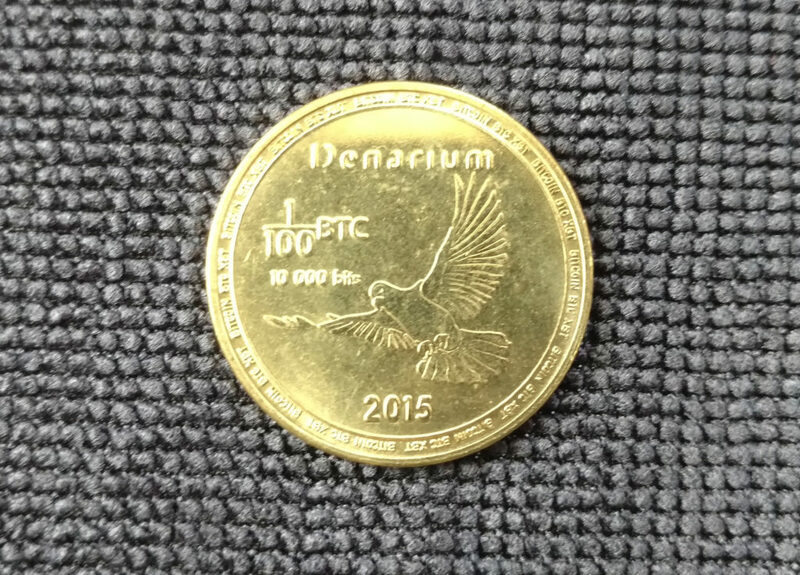 Cryptopods “Ravenbit Podified” coins are a very fun initial offering. We look forward to seeing some new designs in the future. 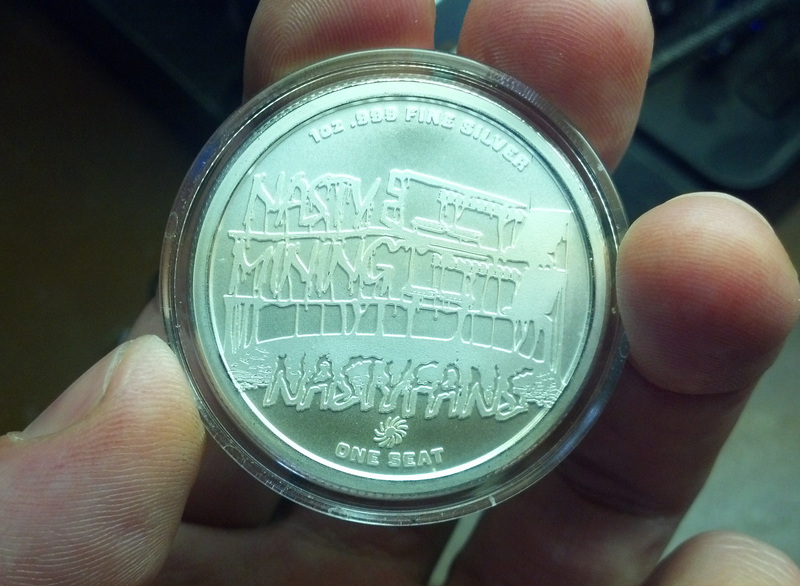 The NastyFans silver physical seat is one of my favorite physical cryptocoins, partly because it has so much going on that it’s practically alive. But it takes some explaining. 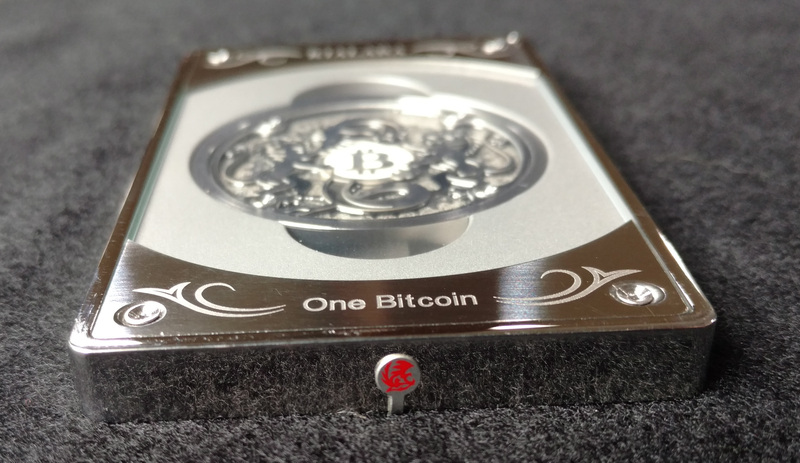 A one-ounce .999 fine silver coin, it has a bitcoin private key sealed beneath a hologram on the back. So far, so good — standard cryptocoin stuff. It’s a little remarkable for having the public address of each coin etched along the rim, a feature that would be great to see more often. But what kind of denomination is “One Seat”? That’s one seat in the NastyFans Fan Club. What’s the NastyFans Fan Club? It’s the unofficial fan club of Nasty Mining, a bitcoin mining operation run by an entity (probably human) named OgNasty. There are a finite number of seats (30,000) in the NastyFans Fan Club, and these seats may be bought and sold through the website www.nastyfans.org. 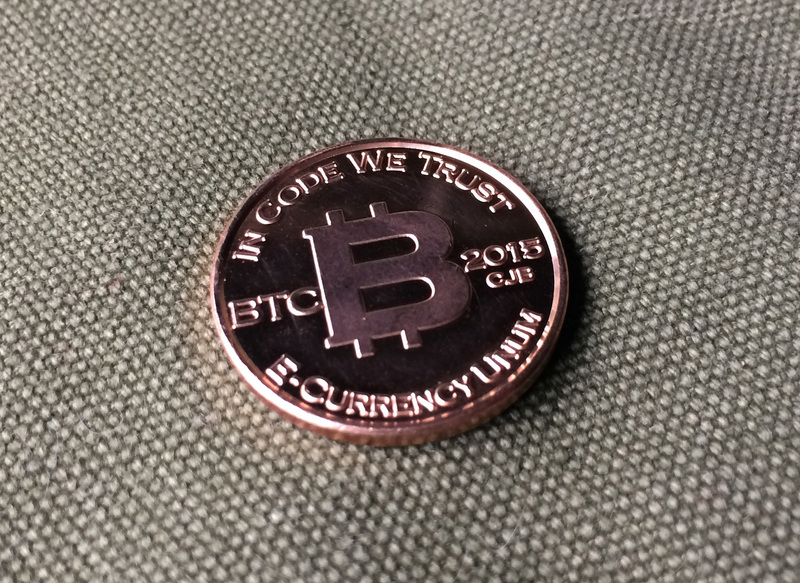 While most seats exist digitally within the website, some seats have been “minted” and are now represented by a physical coin. And that all sounds completely crazy. Here’s what it means: Nasty Mining was and is a bitcoin mining project, but unlike other more ambitious or scammier (take your pick) mining endeavors, they wanted to make sure they kept it legal, didn’t over-promise, and also, kept it fun. 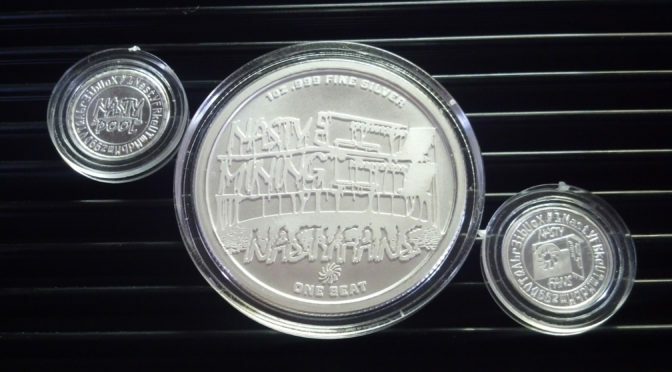 In time, OgNasty branched out into other projects such as a mining pool and creating collectible coins, and those things also feed into NastyFans. When you buy a seat in the fan club, you buy 1/40,0000 of the output from the various Nasty projects (since 25% is automatically reinvested into Nasty Mining). But because of the language used, they’ve kept it legal because, truly… there are no promises. 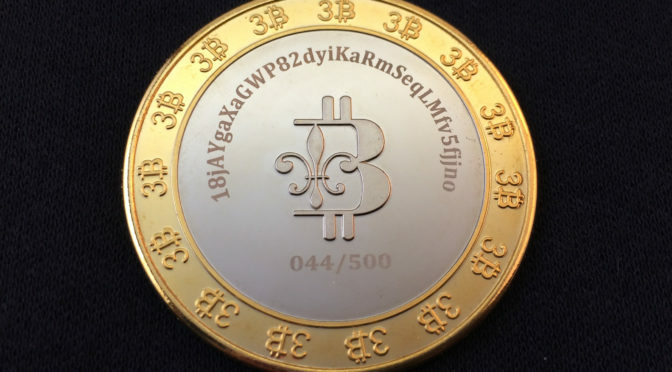 What this means for this coin is that it doesn’t have a fixed denomination. Instead, it receives periodic payouts over time. How much? That depends on how long you hold onto the coin, and how the various Nasty projects fare over time. 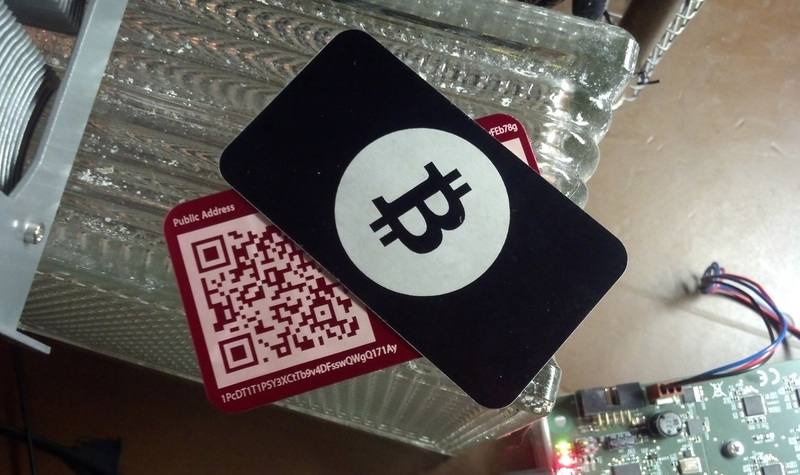 This is not a get-rich-quick sort of thing — the payouts to the coin’s address are small and infrequent. 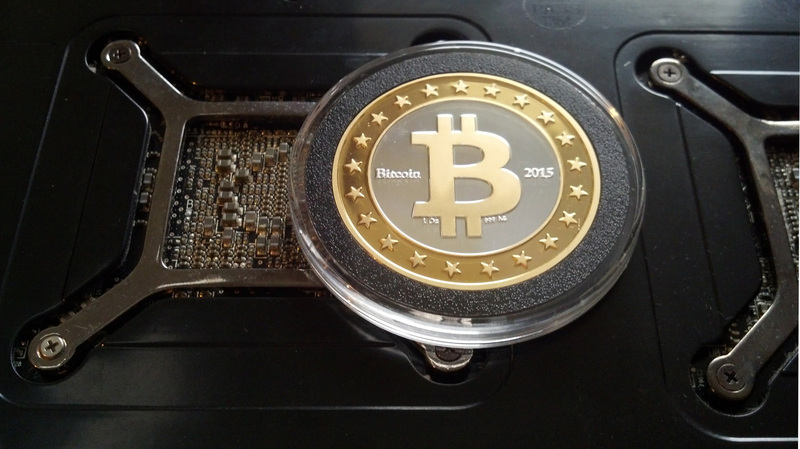 Bitcoin mining is a tough business, and plus, this is just 1/40,000th. 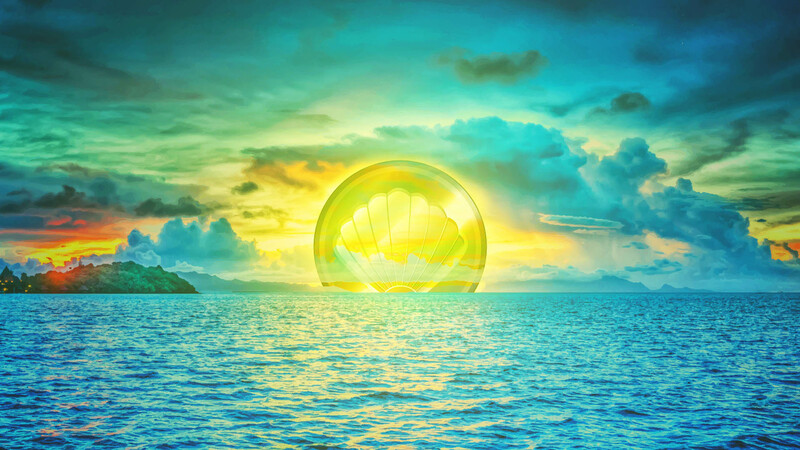 But after 5 years of operation (an eternity in Bitcoinland), OgNasty’s reputation is pretty much iron-clad in the bitcoin community, and the the whole endeavor can be transparently tracked via the thread at bitcointalk.org here. So where does that leave us? An ounce of silver. A fun design, and great quality. 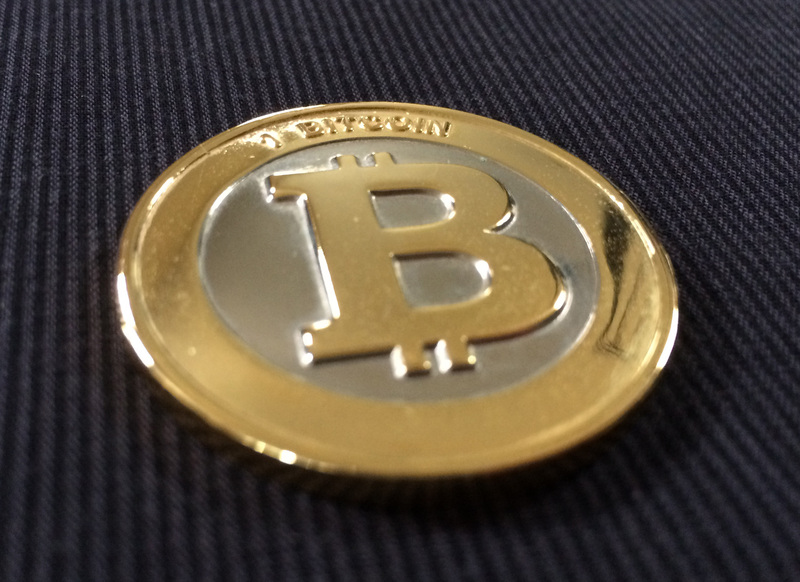 A value that increases over time as more payouts are made to the coin’s address. 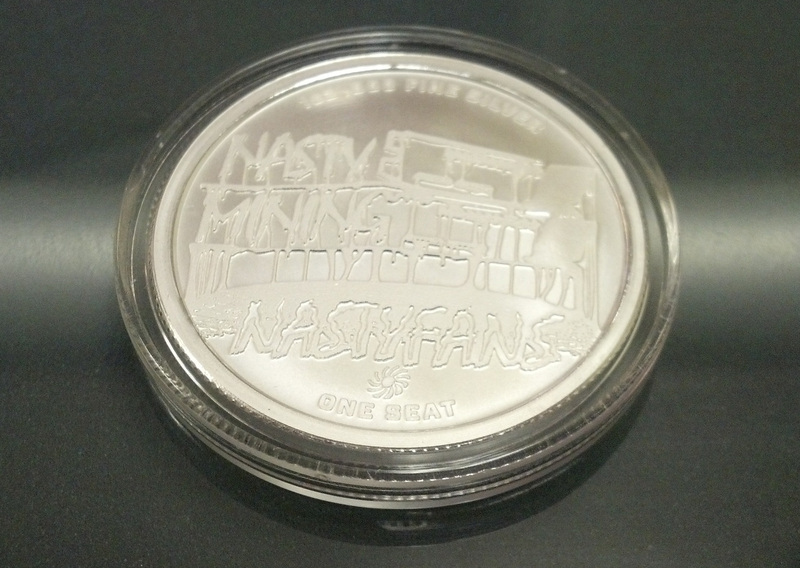 And, a doorway into the bitcoin community: buy a coin, get an account at nastyfans.org, become a part of bitcointalk.org and learn about all the current Nasty projects. Learn some things. Express your opinions. Join us. Some coins have stories, sure, but very few act as an open invitation to a whole world. 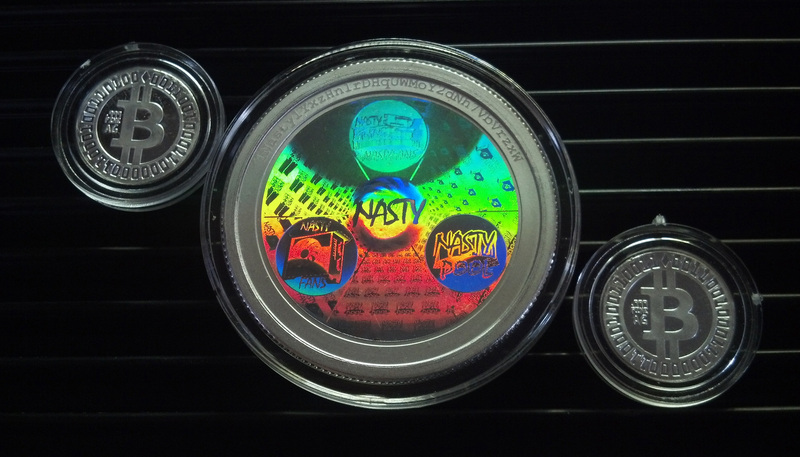 NastyFans suite, reverse: one ounce One Seat coin, plus two one gram promotional coins. Nasty Fans One Seat, obverse. 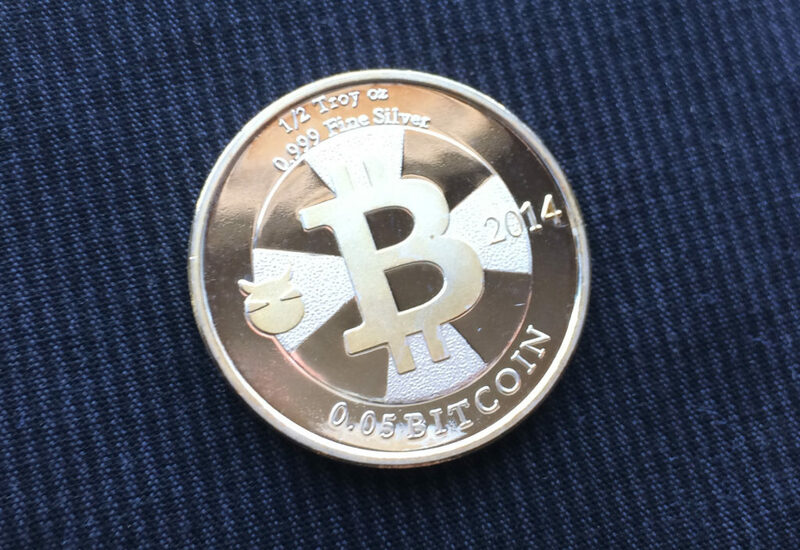 It’s easy to forget that when Mike Caldwell first started making his brass 1 BTC Casascius coins, they were meant to be a fun, affordable way for people to handle, store and share bitcoin — now, of course, a denomination of “1 BTC” is intimidating, and Casascius coins themselves have long since become collector’s items. 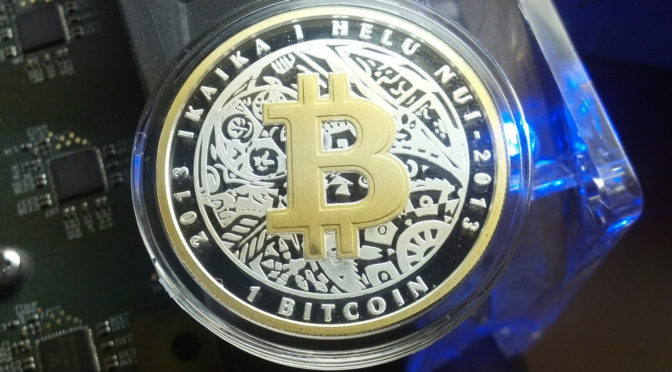 In 2015, Denarium, based in Finland, wanted to get back to those roots, and to that end they created a series of affordable brass coins, each of which contains a private key sealed behind a hologram just like the original Casascius coins. 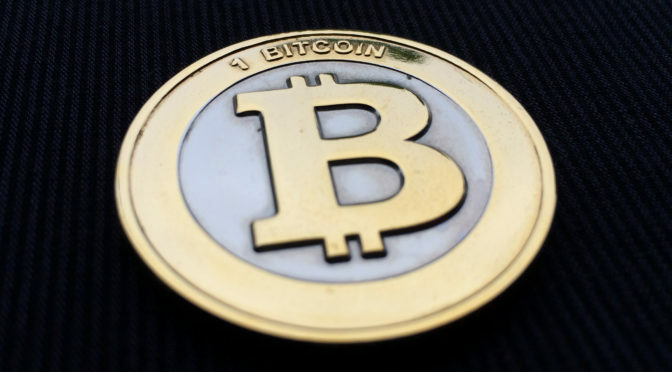 The denominations they chose, though, were 1/100 BTC, 1/10 BTC, and a “custom” option which has no denomination and may be loaded with however much or little you want. They are available either pre-loaded with the specified amounts, or in an empty, buyer-funded form. 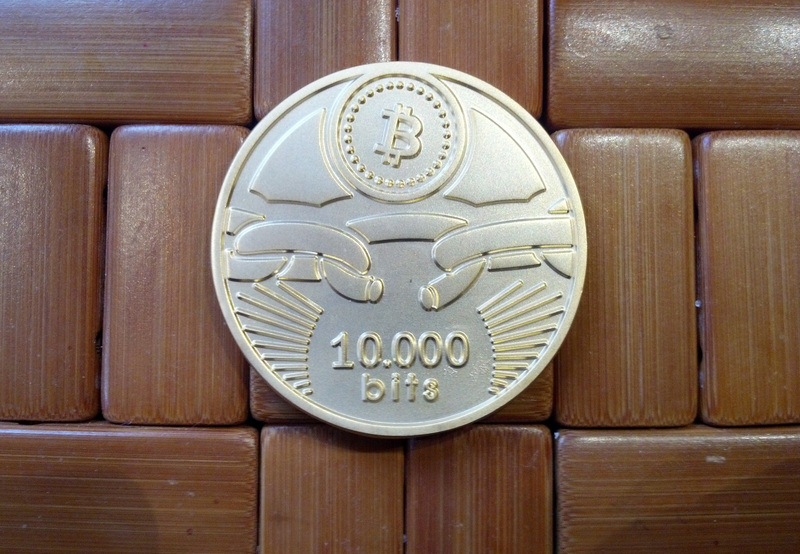 1/100 BTC brass Denarium coin. 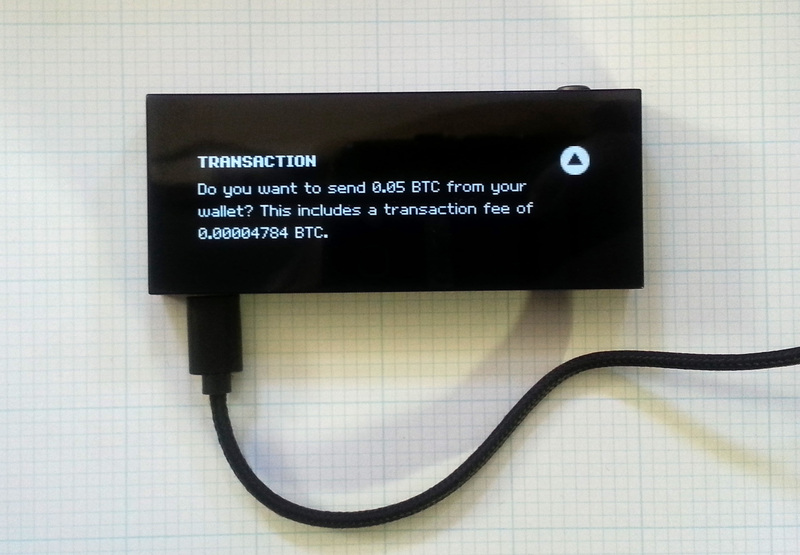 These are a thoughtfully designed and packaged way to share modest amounts of bitcoin. 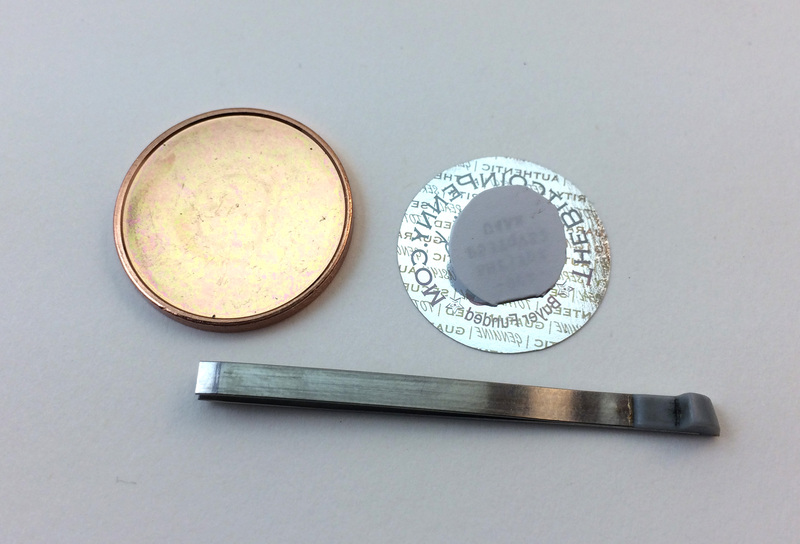 The firstbits of each address is visible through a window in the hologram, and detailed address and public key information is printed on the inside of the packaging. 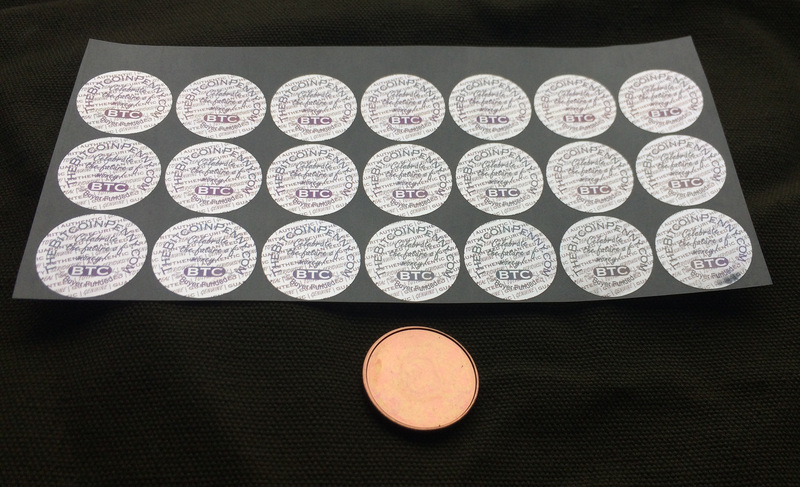 The address QR code is even stickered to the back of each coin’s capsule. 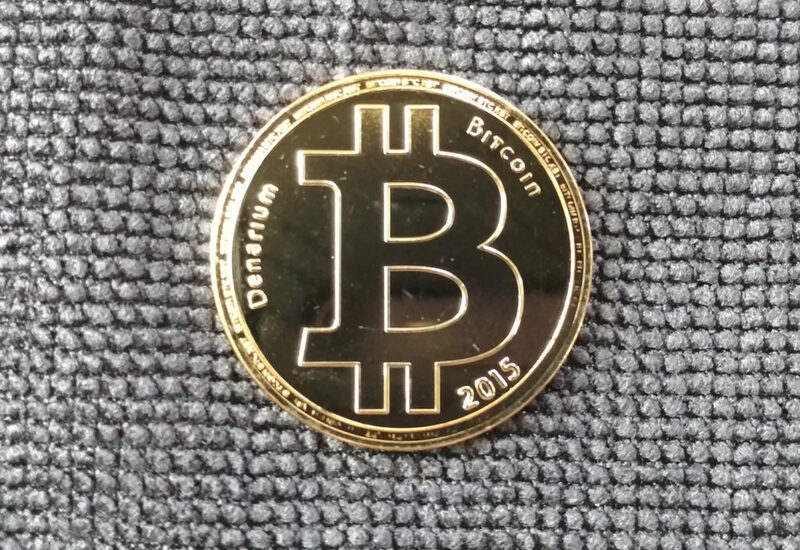 Denarium brass physical bitcoins, reverse. 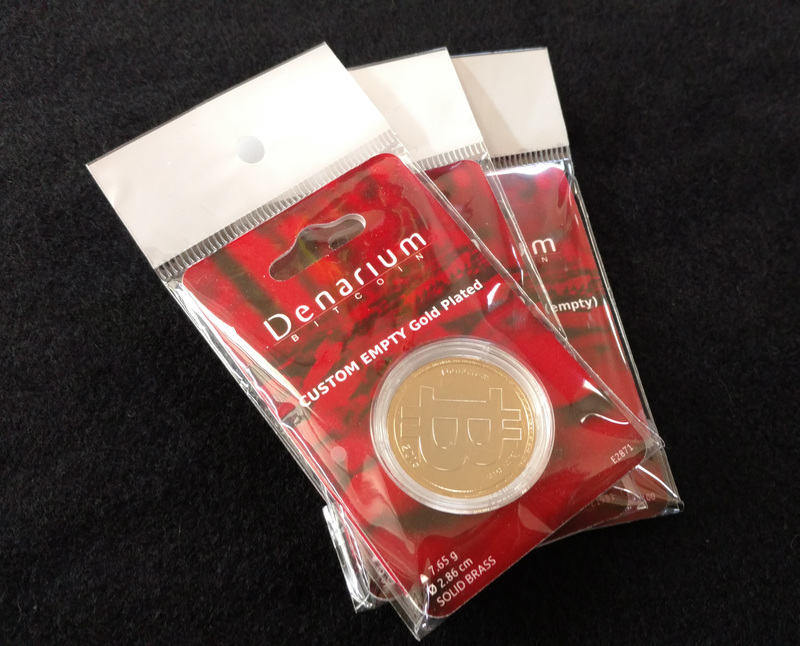 The Denarium packaging contains detailed information about each individual coin. 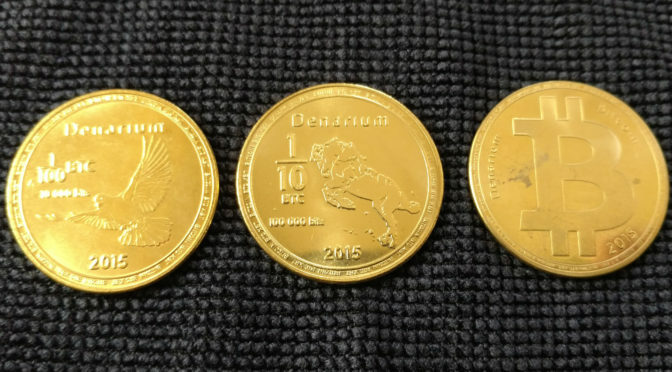 It’s fine that these are not flashy coins, but even as brass coins go they seem to tend toward the low end in terms of production values: fairly dull and a little rough, with some blemishes. The price, though, is hard to beat. 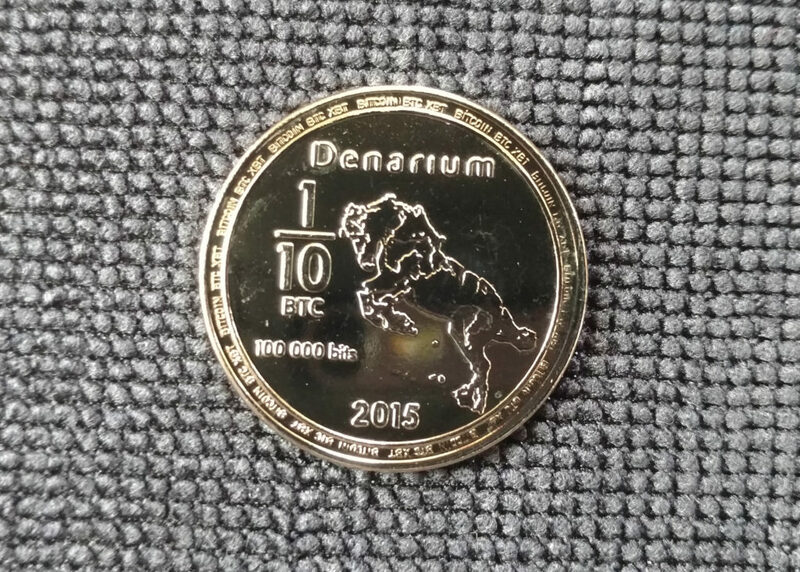 For just a little more Denarium also introduced a gold-plated series of the same coins, and those really shine. They are still affordable, but they are much more impressive to the eye and more satisfying as a collectible or gift. 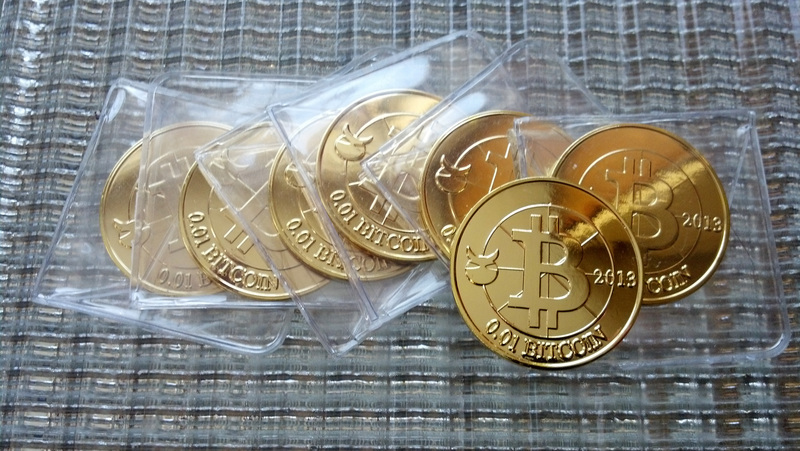 Denarium gold-plated brass physical bitcoins, obverse. 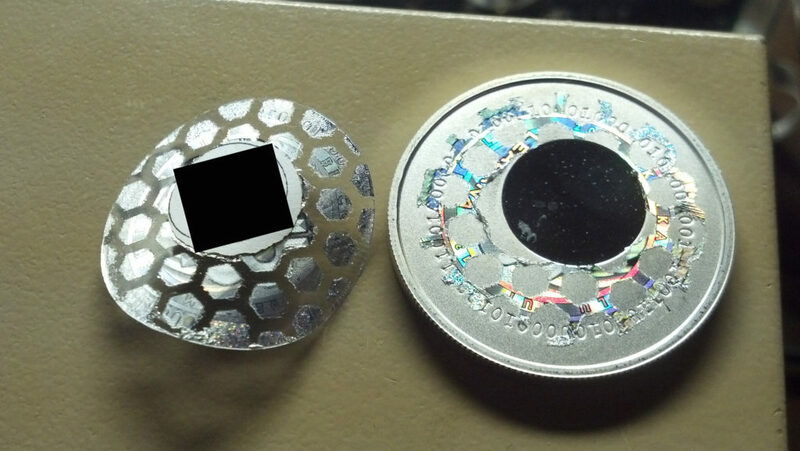 Denarium unplated and plated brass custom coin, for comparison. 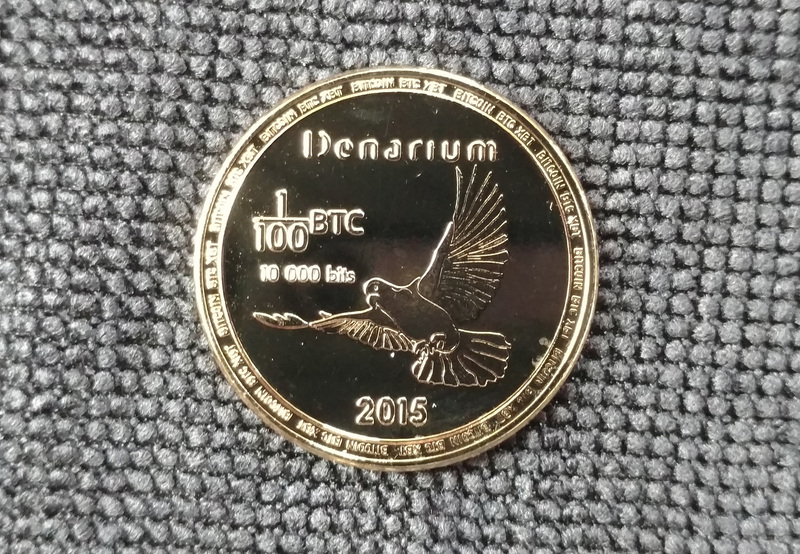 Denarium gold-plated 1/100 BTC piece. 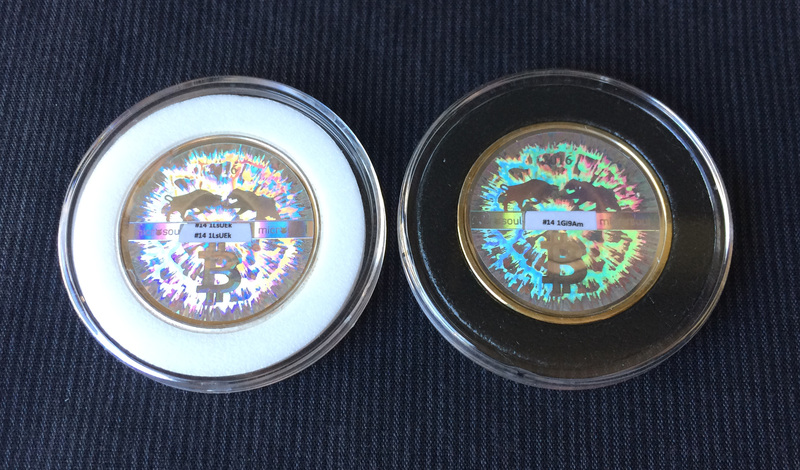 Denarium gold-plated 1/10 BTC piece, featuring scary horse. 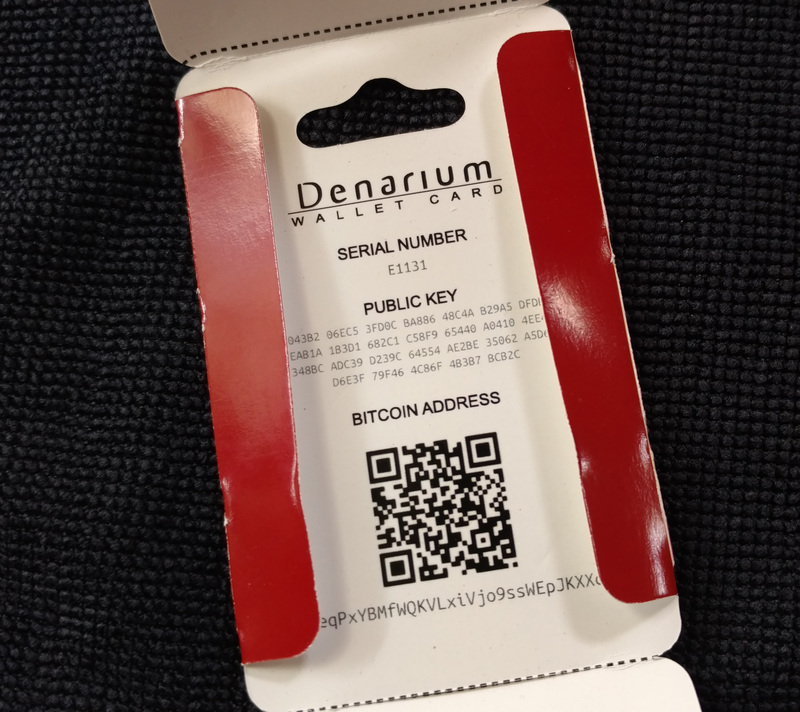 It’s always exciting to see new creators come into the physical cryptocoin field, and Denarium has since expanded their coin offerings into more premium items. We look forward to their future ideas, as well. Thoughtful packaging, meant to reach a mass audience. 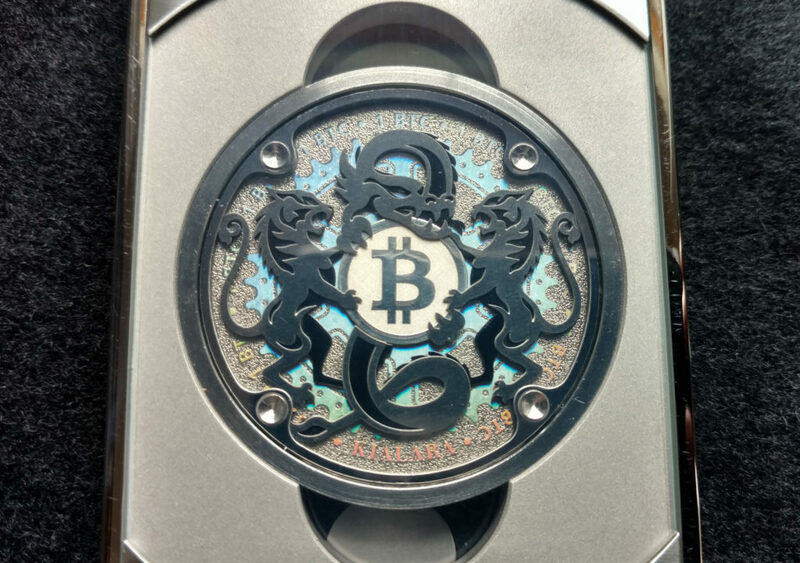 Max Mellenbruch’s bitcoin cold storage art objects have all demonstrated exquisite quality and striking imagination, and his new Signature Series expands enthusiastically on both of those traits. 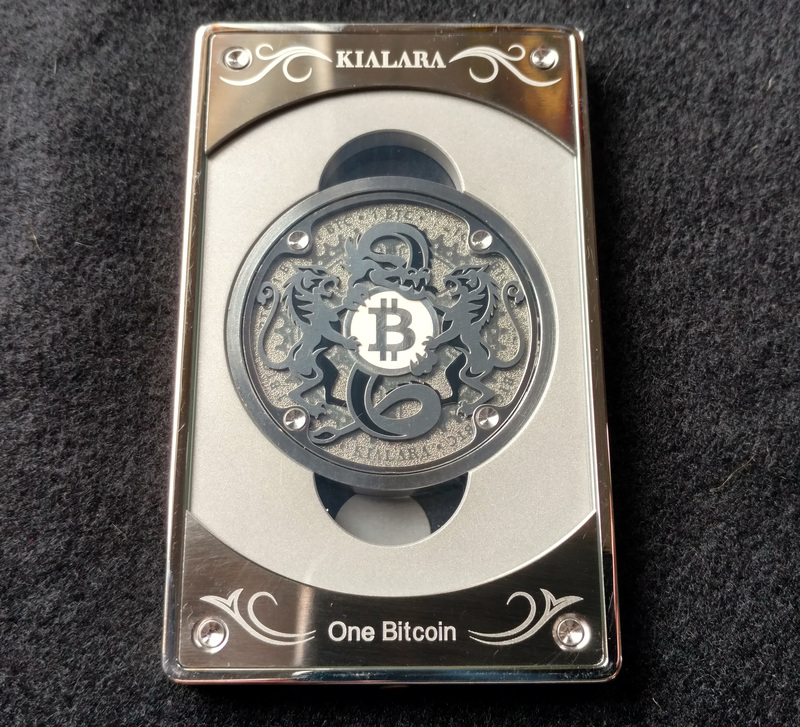 The first generation Kialara bitcoin cold storage wallet was like a fever dream combining a coin, a bar, a vault and a tiny machine into a package that was a delight to behold and a pleasure to handle. The second generation, the Kialara Labyrinth, built a delicate but confounding game into the heart of the coin, in the process creating an item that would be at home in the treasure room of a Tsar. Both kept their private keys locked deep inside under multiple layers of tamper-resistant engineering. 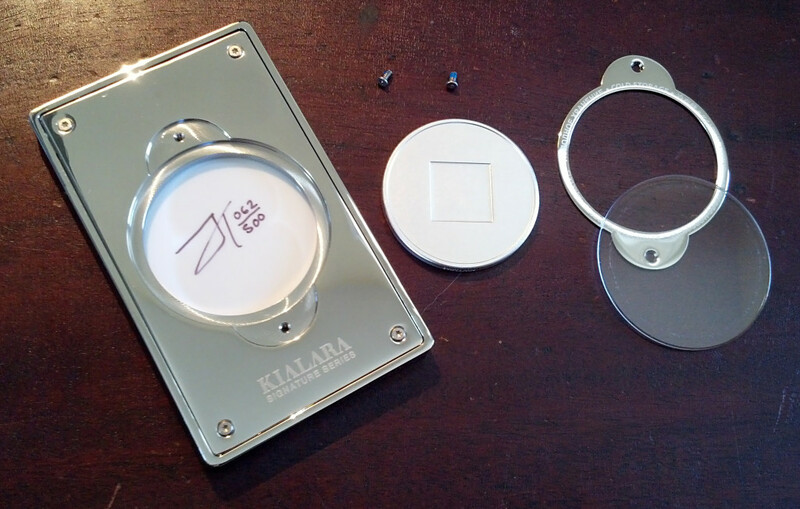 The Kialara Signature Series is more in the cold storage DIY school, in that they contain no pre-generated keys. 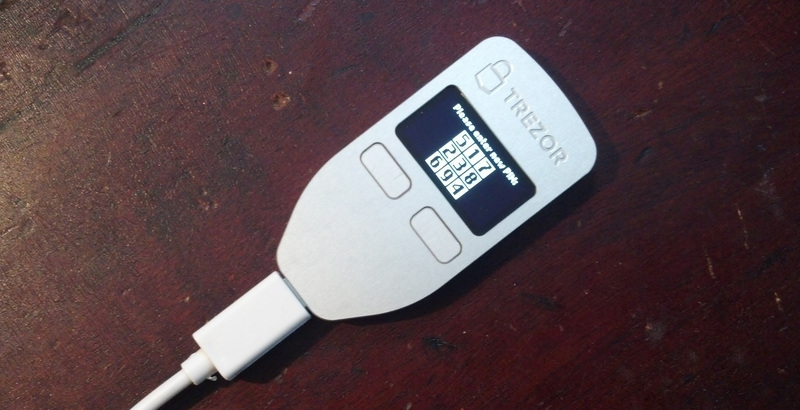 This puts control of the wallet wholly in the hands of the user, as you may generate your own keys with whatever security precautions seem appropriate to you, then seal them inside yourself. 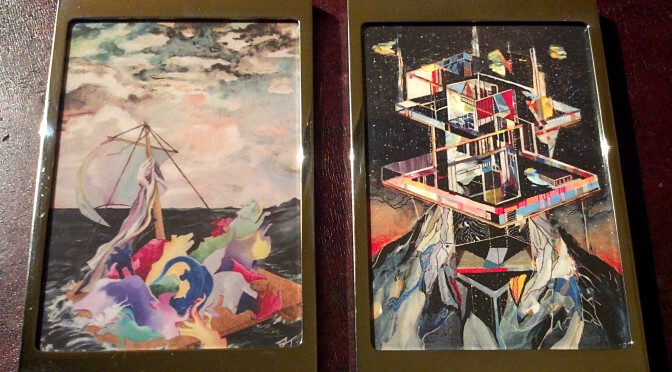 “Currents” by Julia Tourianski and “Excavatorelevator” by Ricky Allman. 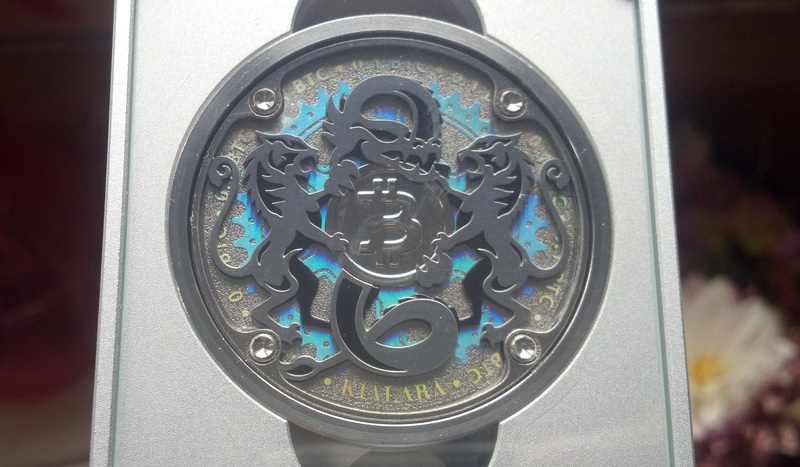 The Kialara Signature Series, reverse. The new offerings are also a departure in their style. 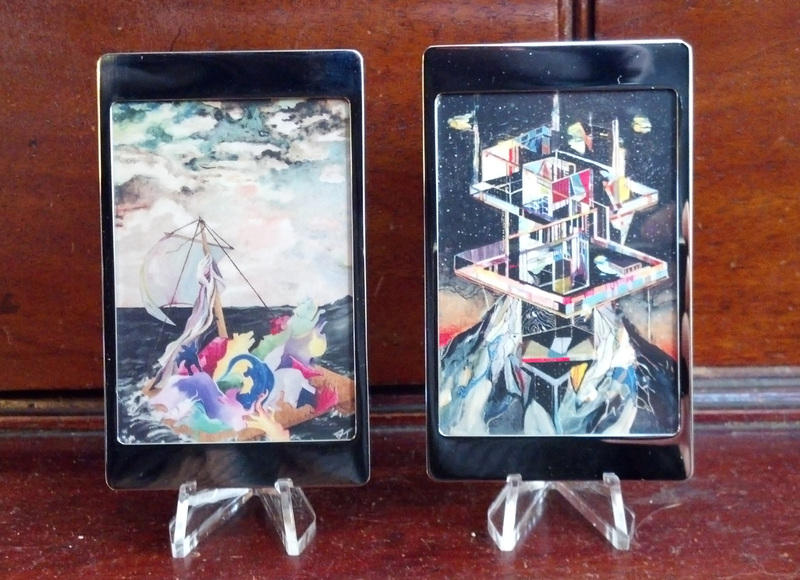 While the designs of Mellenbruch’s previous wallets sprung wholly from his own mind, this time around he brought some friends — there are two different versions in the Signature Series so far, and each one features the artwork of a different artist. Mellenbruch approached two artists he admired and asked them if they’d each create an original work interpreting Bitcoin in their own way. The results were then reproduced in limited editions of 500 on museum quality archival card stock, sealed behind tempered glass and framed by mirror-polished stainless steel. The results are stunning. For one thing, these are by far the shiniest things I own. I can’t even figure out how to photograph them, since the frames just reflect the world around them as if they’re powering up a stealth field, or bending light around them like small rectangular singularities. They are also heavy as heck. I don’t want to give away Mellenbruch’s secrets, but he obviously knows that quality is supposed to have a certain weight. Although these are made of steel, glass, and silver, upon first handling they seem startlingly dense, as if you’re handling an exotic element like gold or mercury. 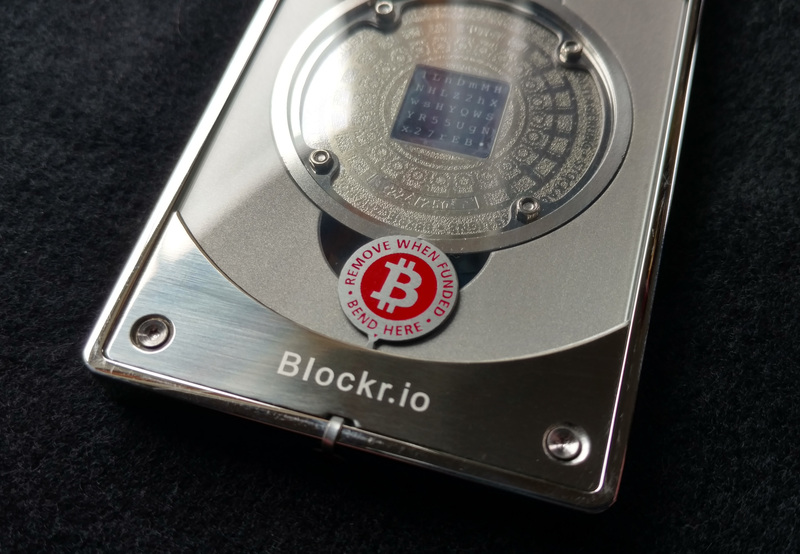 Locked inside the heart of each one is a medallion containing one pure ounce of .999 pure silver, naturally, with a square indentation in which the user may inset their private key. It’s elegance incarnate. 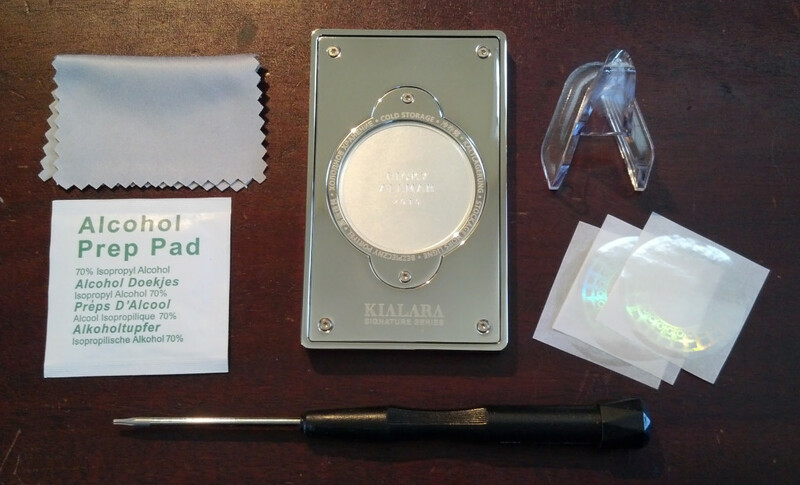 Each Kialara Signature comes assembled, with everything you need for disassembling and placing your own private key in the medallion: a Torx screwdriver, a set of 3 holograms and both a microfiber cloth and an alcohol wipe for preparing the surface. 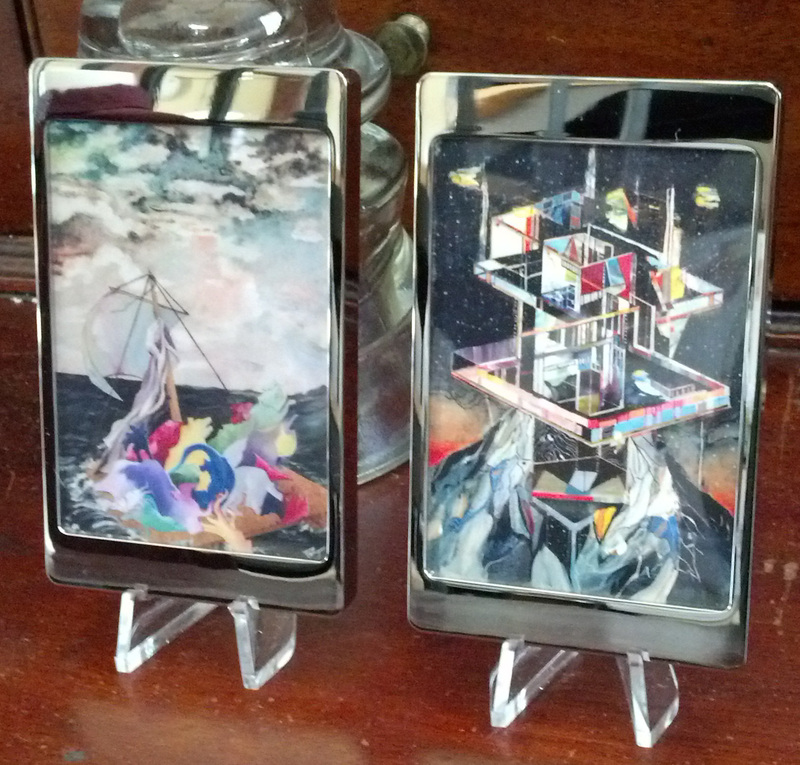 A clear plastic stand is also provided for standing your Kialara up on your desk, shelf or altar. Inside the Kialara Signature Series. 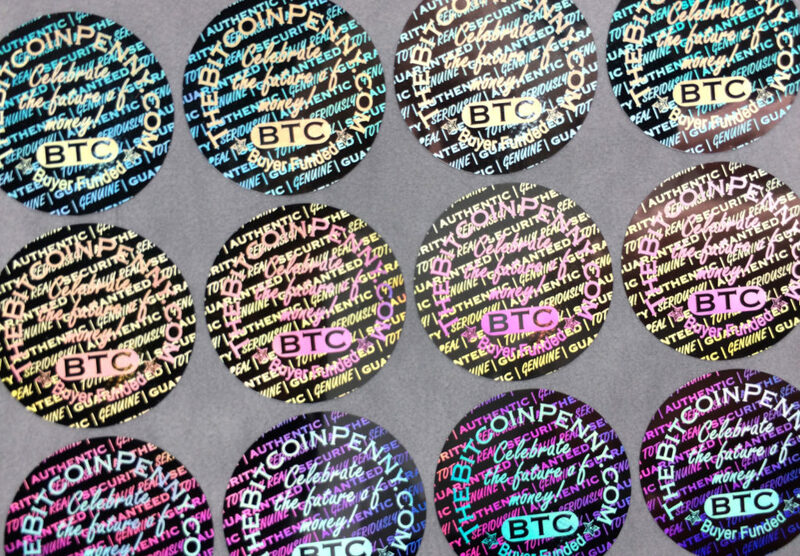 Both works of art are lush and vibrant with color and motion, but they represent two very different approaches to Bitcoin-as-art. Ricky Allman’s Excavatorelevator 1 uses architectural imagery, walls and panels and planes of color rising up out of a more fluid geology. If it’s a building, it’s a living one that’s unfolding right in front of us, or maybe assembling itself, floating against a starry night sky. A mining metaphor? The soul of the blockchain? It’s up to the viewer to make their own connections with these works, and that’s half the fun. The more you look, the more you’ll see. And that’s a lot like Bitcoin itself.